When I arrived at work on Monday and checked with the office manager, I discovered that she hadn’t finished her piece of August closing so I completed my routine weekly reports. The city of Denver is doing work on the water, sewer, and electrical lines in front of our studio and the water was cut off, so I decided it was a good time to take the afternoon off and go fishing. By the time I drove home, ate lunch, loaded the car and drove to Clear Creek it was around 1:30. It took me another 15 minutes to gear up and then I hiked down the bike path for another 10 minutes before I began fishing at 2PM. I began with the traditional yellow Letort hopper trailing a beadhead hares ear. I picked up a couple small browns (6-8 inches) on the beadhead and then as it clouded up I added a RS2. I was covering a lot of water as I was fishing mainly the pockets along my side of the creek. The section I was in was quite fast with the main current a straight chute down the center of the streambed, and the flows were still strong enough that I couldn’t find a safe spot to cross to the north side, although I would have loved to explore those pockets. Eventually I swapped out the hopper for a Chernobyl ant, and I landed a couple small fish on the Chernobyl. But I was experiencing a huge quantity of refusals and foul hooked fish as I reacted to surface movement and hooked fish on the trailing nymphs. After an hour and a half I’d landed five small brown trout and experienced a huge amount of frustration due to refusals, foul hooked fish and resultant tangles. Since the fish were obviously looking to the surface I clipped off the nymphs and started to experiment with attractor dries. First I tied on a royal stimulator that I’d purchased, but that gained me one refusal and then not even any looks. Next I rummaged through my small plastic cylindrical container where I stash my large dry flies and attractors, and I noticed a gray parachute hopper. 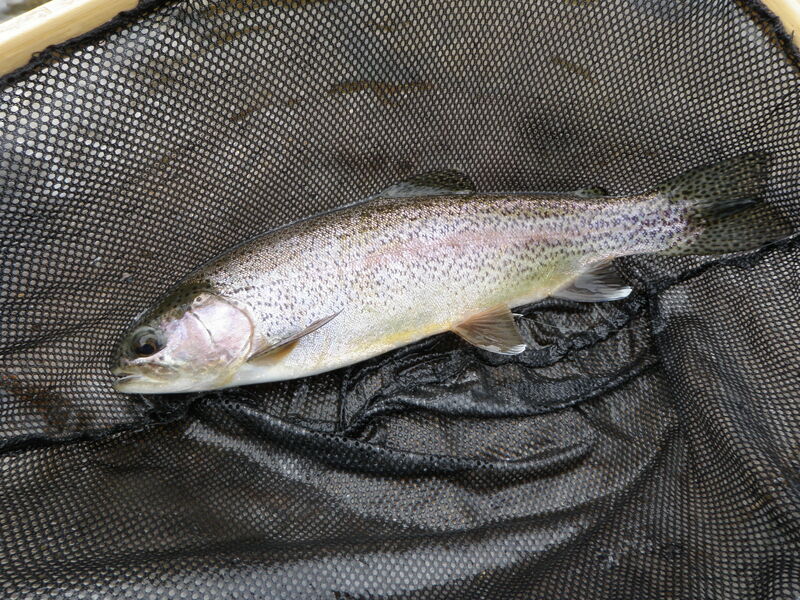 My son Dan told me he caught four rainbows in a trout pond over the weekend on the gray parachute hopper I’d given him, and they slurped it with confidence. I grabbed the parahopper and tied it on to my tippet and began working the side pockets. It was magical. 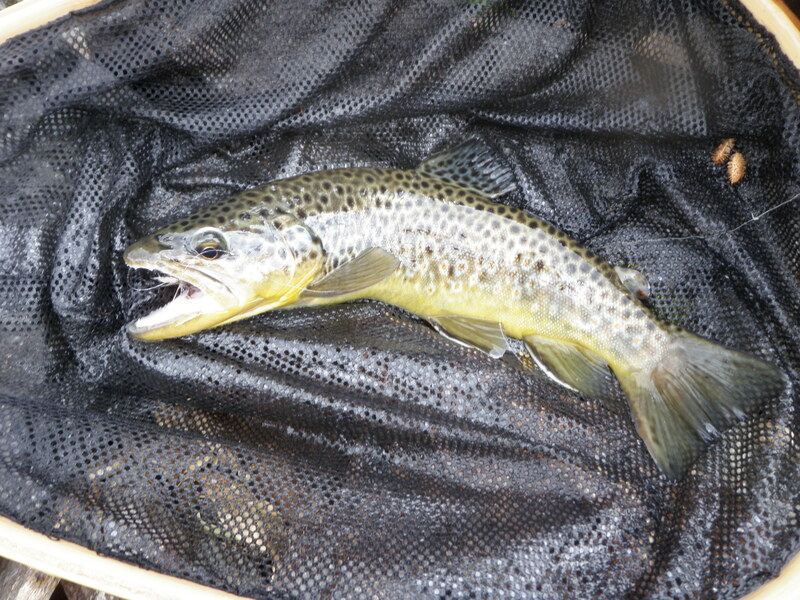 Over the next half hour I landed five brown trout and each fish was larger than any of the fish I landed in the first hour and a half. The fish didn’t typically jump on the fly on the first cast, but usually the second or third, and they exhibited a confident take as they calmly rose and sipped it in. Normally I’m a big believer that reading water, fishing where there is less pressure and making good presentations is more important than fly selection. But Clear Creek convinced me that sometimes fly choice can make a big difference. I’d like to return to Clear Creek while the weather remains nice and cross to the north bank and see if the parachute hopper can continue to work its magic. Unfortunately I lost the productive parahopper in a tree, and my inventory is getting quite low so I’ll need to tie some more. Temperatures were forecast to hit the mid-80’s on Sunday and in fact for most of the last week of September. Anticipating a busy week at work, I decided to make another trip to the Arkansas River while the weather remained nice. 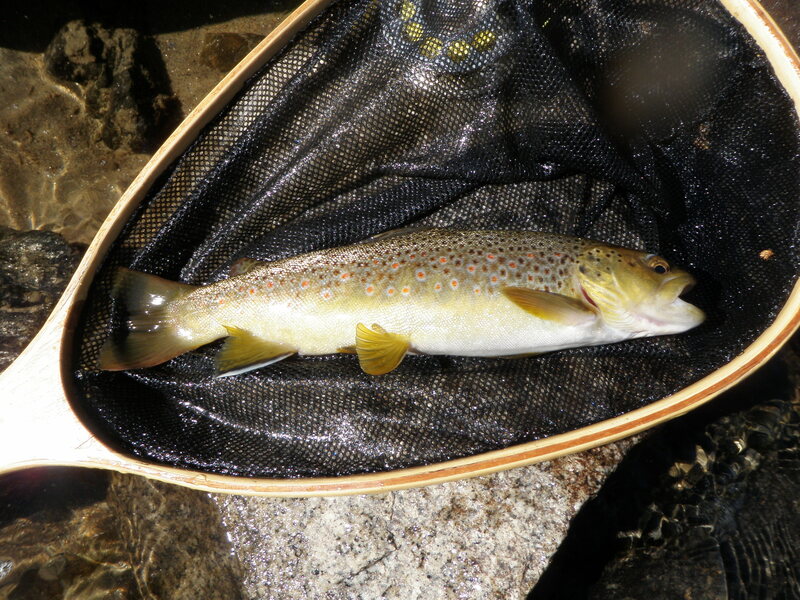 I checked the ArkAnglers report and it stated flows were low (298 cfs) and there was BWO activity between 1-4PM. 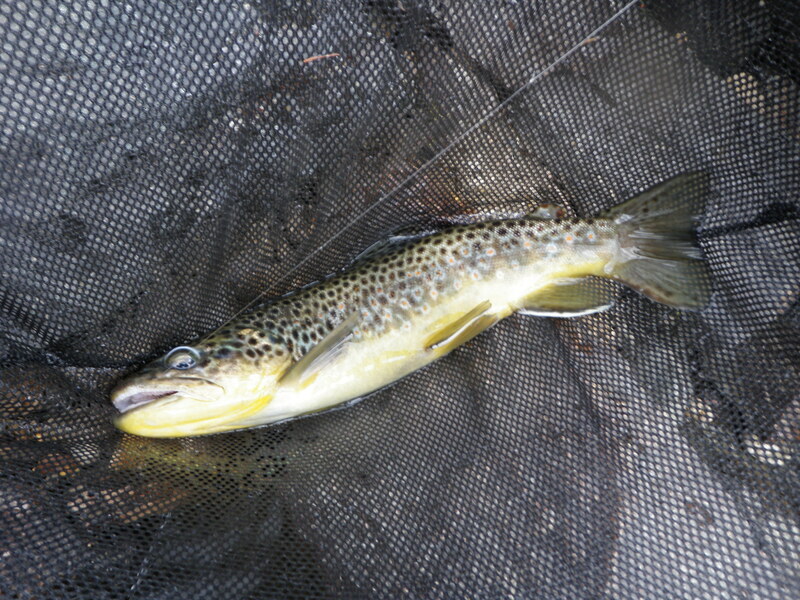 The report also suggested midges and tricos in late morning and small indicators. I arrived at the river by 10:30AM and parked at the Fremont-Chafee County line pullout. Originally I planned to fish upriver near where I ended when I made the Tuesday trip with Amy and Joe, but I was still bothered by not catching any fish in the north channel by the small island downstream from the pullout. I knew there were fish there and decided to cover this water again. I crossed at the tail of the long county line pool, climbed the north bank and hiked down the railroad tracks to the normal starting point below the island. I was in the river ready to fish at 11AM and elected to use a lime green trude as my top indicator fly. Below that I tied on a tiny black midge larva with a bead and silver ribbing and then below that I added a sunken trico pattern I’d purchased at the North Fork Angler on Thursday. I covered the attractive series of runs below the island with only an inspection to show for my efforts. A decent fish rose up within a foot of the surface to look at the trude, but did not elect to feed. I started in a small pocket at the very bottom of the right channel (north) and had no luck, but in the next pocket a brown grabbed the tiny midge larva, and I landed and photographed my first fish of the day. Amazingly in the same small obscure pocket next to the north bank, I hooked and landed two more twelve inch browns on the sunken trico. I worked up to the large smooth pool and on a long cast three feet out from the bank noticed a large bulge near my fly. I set the hook and experienced a momentary hookup to what felt like a decent fish. The tiny stuff seemed to be producing. But as I covered the bottom half of the pool I couldn’t entice more action while at the same time noticing numerous rises in the run that fanned into the pool. I waded into the pool a bit and shot some casts to the top anxiously anticipating action. Unfortunately I began to elicit refusals to the lime green trude, and the fish weren’t paying any attention to the trailing flies. After working the area with a shotgun of casts and still seeing occasional rises, I clipped off the three flies and tied on one of the two trico spinners I had in my Pennsylvania box. On perhaps the fifth cast to the center riffle a nice brown rose and sipped in the trico. I was thrilled to catch another nice fish in the north braid on a tiny dry fly. I landed another decent fish in the next pocket above the large pool on the trico spinner, but then it ceased drawing interest. I didn’t want to waste the remainder of the channel on the spinner, so I tied the three original flies back on my line. I removed the midge larva and substituted a RS2. 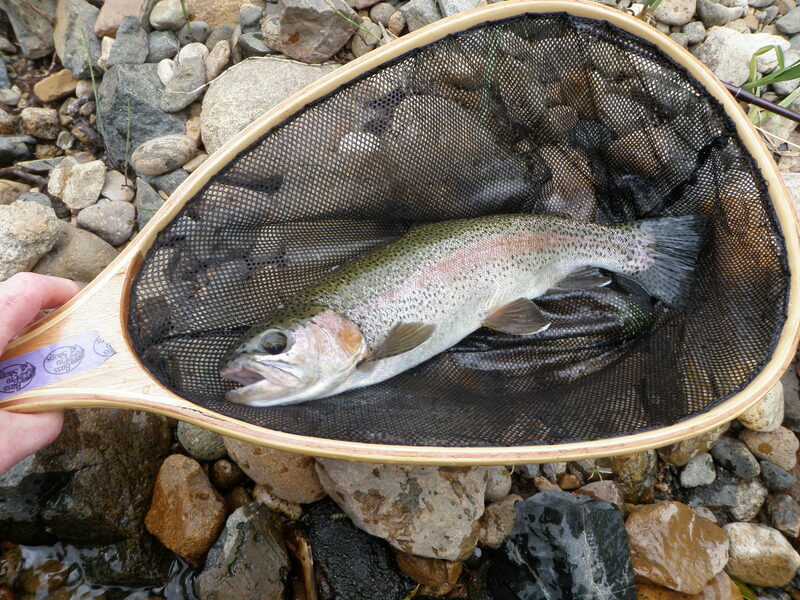 By the time I reached the top of the small channel I landed four more nice trout and most of these were rainbows. 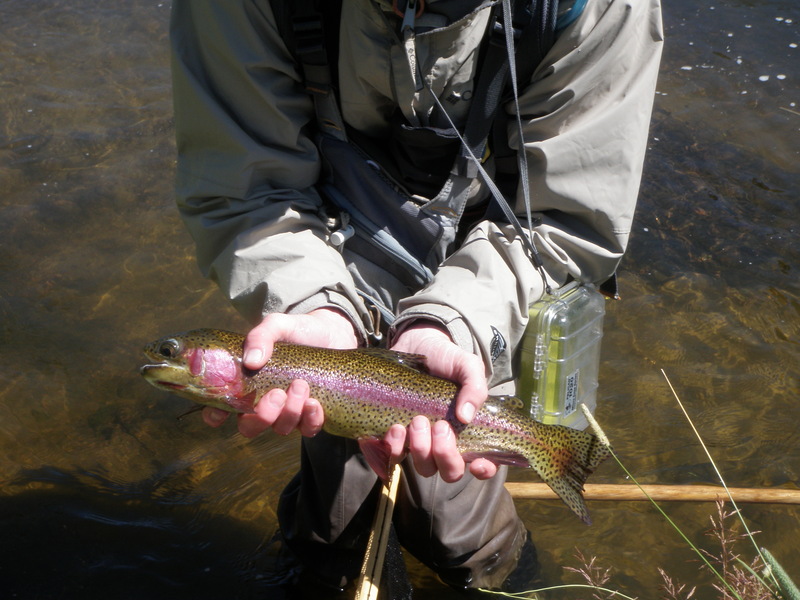 One particularly tough rainbow ignored my flies when I cast into a five foot long pocket when I approached from below. I could see the fish hovering in the middle of the pocket. Once I got slightly above and to the side, and after making some upstream casts along the left side, I flicked a couple casts back into the pocket and eventually the beautiful rainbow couldn’t resist and grabbed the RS2. As I worked upstream I began to notice larger mayflies, so I believe the trico hatch waned and the BWO’s kicked in. I began to catch more fish on the RS2. 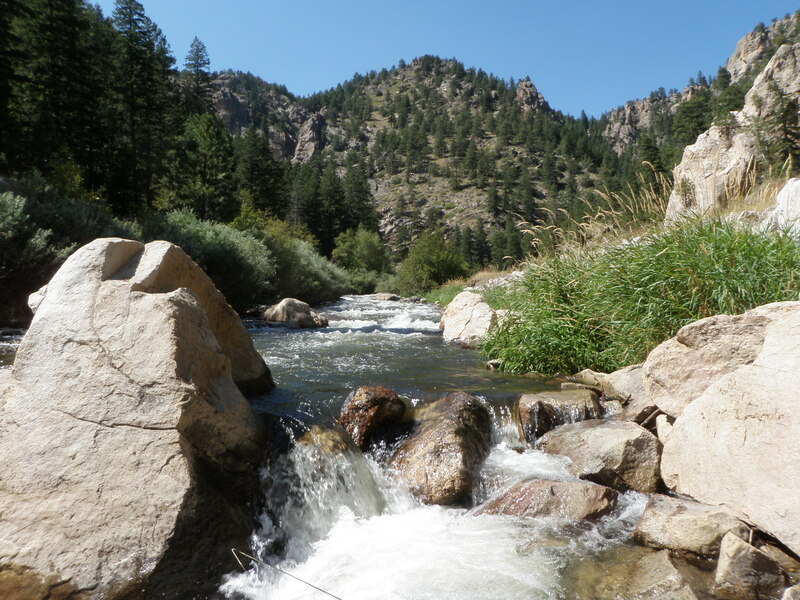 My original plan was to skip the water above the island and wade back across for lunch, check out the deep rock pool while I ate lunch and then drive back toward Salida and resume fishing where I ended on my previous trip. 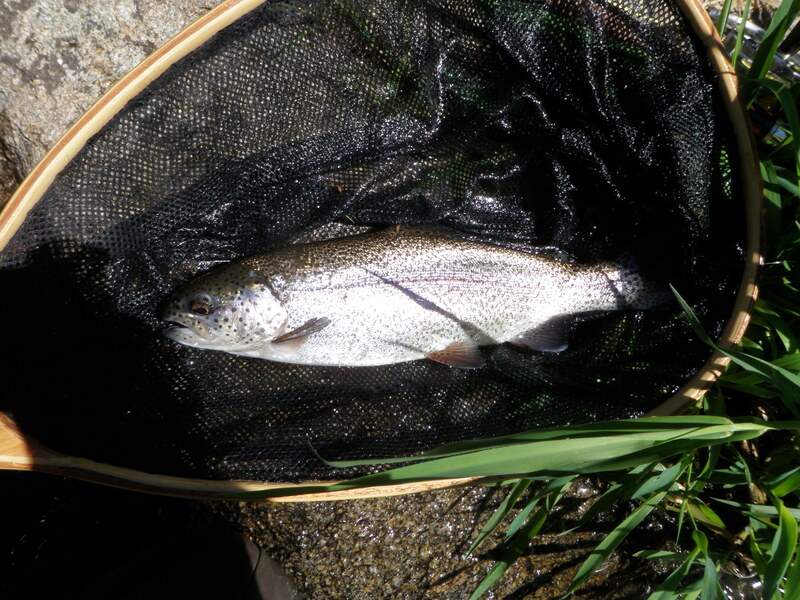 But as I waded up the river I couldn’t resist flicking casts into some juicy runs and pockets and landed another three fish, one brown and two nice rainbows, before I crossed back over to the car for lunch. Much to my surprise it was nearly 2 o’clock when I checked my watch while wading across the river for lunch. Indeed as I ate my lunch I spotted three fish feeding leisurely in the high rock pool. I took my lunch bag back to the car and grabbed my rod and attempted to circle around the rocks and approach the pool from the side. Alas, by the time I was ready to cast the trout disappeared. 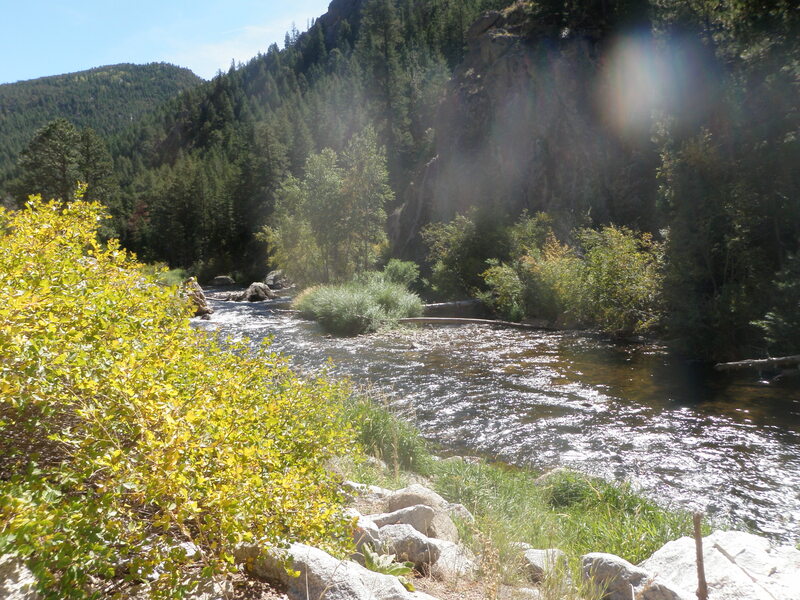 I prospected a few casts, but had no success and returned to the car and drove to the second pullout traveling west toward Salida. I climbed down the bank to the sand beach area and waded across to the north shore. This crossing proved to be a bit dicier than the previous with one deep swift spot giving me a scare. Once on the north shore I climbed the bank to the railroad tracks and hiked east a short distance and then slid down the bank to the beginning of the pocket water. With the wind picking up and some BWO’s still present, I elected to tie on a yellow Letort hopper, beadhead hares ear and RS2. I covered quite a few pockets with no action, so I removed the BHHE and fished with just the hopper and RS2. Eventually a nice fish rose and smashed the hopper and as it ran downstream I got a good look at what appeared to be a nice rainbow. I allowed the fish to strip out line, but when I finally gained some control, it made a sudden reversal and broke off my flies. I continued fishing the pockets and landed two more rainbows, one very nice fish in excess of 15 inches on the hopper and a second on the RS2. Nearing 4PM I exited the river and hiked back down the railroad tracks and had another difficult crossing where I’d crossed previously. There is a nice deep narrow pool next to the beach and I spotted a nice rainbow holding a foot below the surface two thirds of the way down the pool. I flicked my flies just above the rainbow and it slowly rose, but I reacted too quickly and set the hook slightly nicking the fish. The fish remained in its position for a bit, but it was now wary of my presence. I ended my day at this point satisfied with 14 nice fish with the smallest 12 inches and several in excess of 15 inches. After landing two fish on the North Platte I was feeling unfulfilled and in need of some fish to bend my rod. With another day available to fish and high temperatures in Denver projected to be 85, I decided to make another fishing trip. 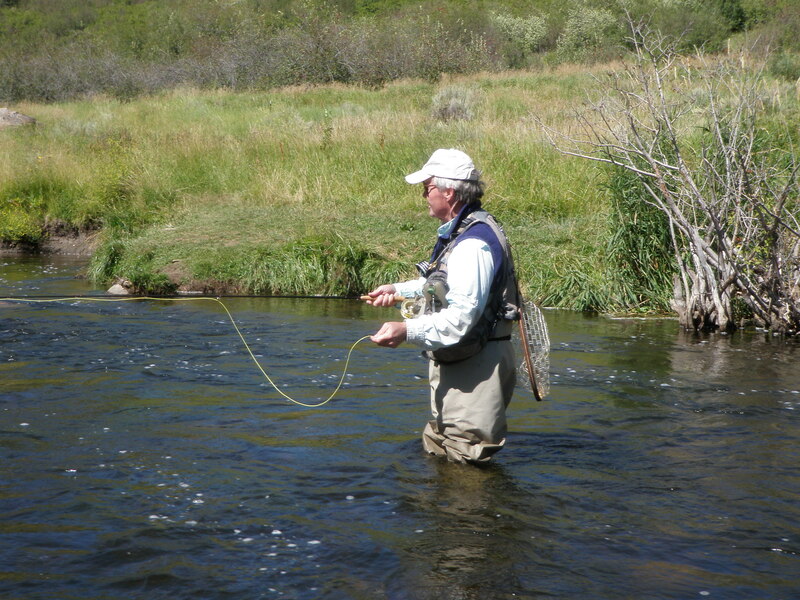 I was weary of driving after the long haul to North Park so I checked the flows on the Big Thompson. They had dropped to 90 cfs over the past two days and that is still a bit high for late September but much improved over the 150 cfs spike I experienced on my last trip. I left my gear in the car so packed a lunch and filled my Camelback, and I was off by around 8:30AM. As I drove down the canyon from Estes Park I was looking for a stretch where the sun was hitting the water, and I found a nice area a couple miles below the dam. After rigging up I hiked down the road a bit to the bend and noticed some no trespassing signs, so I reversed approximately twenty yards and cut down to the water through some dense willows. I tied on a Chernobyl ant and a hares ear nymph as the dropper and began flicking in the likely pockets and pools. In short order I had a couple refusals to the Chernobyl and then a ten inch brown darted up and inhaled the large foam imitation. For the next two hours I worked my way upstream mostly on the left bank away from the road and picked up two more trout on the Chernobyl. I was getting five refusals for every fish that succumbed, and this frustrated me. I went through a period where I tried a caddis, a royal stimulator, a gray parachute hopper, and a yellow Letort hopper; but none of these ever created refusals so I returned to the Chernobyl ant. Toward the end of the morning I began to observe midges so I added a black ribbed midge larva below the hares ear. There was a tough lie ahead where some branches hung out over the water so I side armed a cast beneath the branch and let the three flies drift back along the bank in the shadows. As I lifted to pull the flies at the end of the drift a brown darted out and grabbed one of the nymphs. I landed a nice twelve inch brown and amazingly it had taken the tiny midge larva. At noon I exited the river and drove downstream to the handicapped platform area hoping to jump in around the bend and fish back up toward Grandpa’s Retreat. Just about every pullout was now occupied by a fisherman vehicle, and this amazed me for a river that doesn’t produce very sizable fish. I ate my lunch on the bank while watching another fisherman work his way upstream with no apparent success. I returned my lunch bag to the car and gathered my fishing gear and walked around the bend on the highway and then cut down to the water twenty yards above the bend. Much to my chagrin as I pulled back the willows to enter the water another fisherman in a blue shirt appeared. I acknowledged his presence and did a quick U-turn. What should I do now? I decided to drive back downstream below the special regulation boundary, and as I did so, I spotted two pullouts near two stretches of water where the gradient didn’t appear to be too severe. I parked and walked down the road to a point where I thought I could scramble across the rocks and through the willows. It turned out to be more difficult than I thought and the water was rushing quite rapidly forcing me to contort myself to move upstream tight to the willows and shrubs. But once I got in a decent position the fishing heated up quickly. 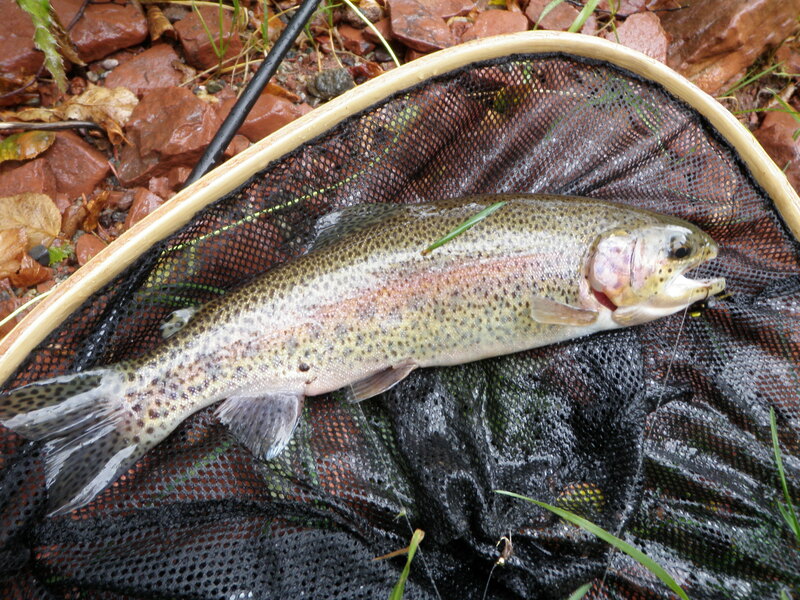 I landed four rainbows on the BHHE in a half hour or so after lunch. Once I moved past the thick streamside vegetation to where the river flowed next to some large rocks next to the road, the fishing slowed. I was still able to pick up fish, but not in every likely pocket like I’d experienced in the less accessible area. Over the course of the next couple hours I added four more fish mostly on the hares ear, but a couple on the Chernobyl as well. By 3 o’clock I’d reached twelve, and I was pretty satisfied with my day. I arrived at a nice deep pool across from me and I could spot at least six fish, two at the tail and four at the midpoint up to the head. By now a sparse hatch of BWO’s began to emerge so I added a RS2 below my Chernobyl and hares ear and experienced a brief hook up with a fish in the middle part of the pool. The fish seemed to be showing no interest in my RS2 so I decided to go deep with a split shot and strike indicator. Just as on Thursday on the North Platte, this had no impact, yet I could see the fish and they seemed to be eating something. Finally I watched a single fish for awhile and noticed it rose to the surface once. It was the only surface rise I saw, but because of the lack of success with other methods, I decided to go to a CDC BWO. I cast the tiny tuft towards the tail and immediately had a refusal from a small brown. I worked the middle and then the top of the pool where I cast downstream and let the eddy bring the fly back to the heart of the eddy. After flailing with no action for ten minutes or so, I sent a cast downstream to the tail again. When the tiny tuft of gray got to the end of the drift it did a little curl and hop. Normally drag is the enemy of a fisherman, but in this instance it aroused a nice brown trout who swirled and inhaled the tiny fly as it skipped across the water. The tiny drag must have imitated a natural trying to escape the surface film. I landed the brown and photographed and then caught one more nine inch rainbow in the middle of the pool before calling it quits for the day. Humility is a good thing, and the North Platte River humbled me on Thursday. Last September I did a camping/fishing loop through northern Colorado around the same time of the year and had a blast on the White River, Yampa River and then on the last day on the North Platte River. Spending time with Amy during her visit took precedence over a fishing trip, but I was anxious to return to the North Plate River. 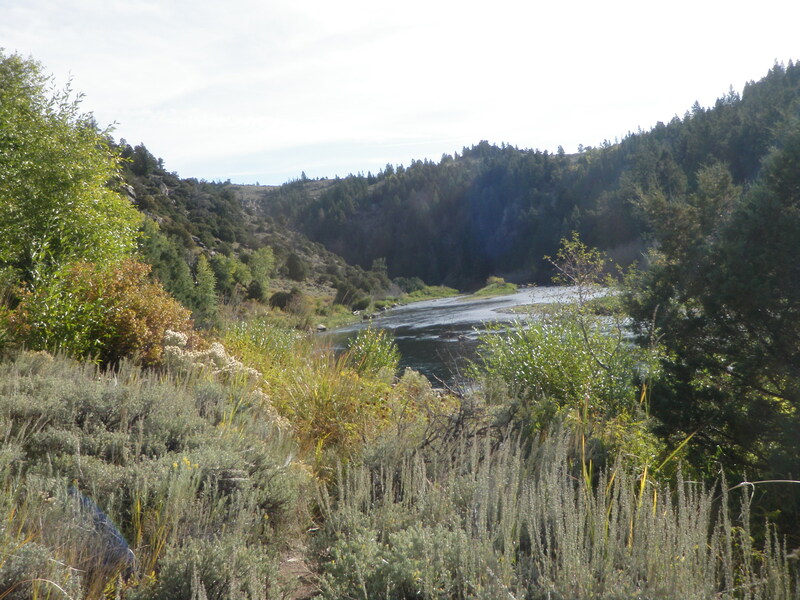 During my visit in 2010 to the North Platte I felt I did more exploring than serious fishing, and I wanted to give it another opportunity with the scouting trip behind me. It takes three hours to drive from Denver to Walden, and then another 20 minutes from Walden to the trailhead, and then another half hour to one hour to the good fishing depending on how deep one wants to go. This is really too much to turn around in a day trip so I reserved a room at the North Park Inn and Suites for Wednesday night. I packed the car when I arrived home from work, and then Jane and I went to Wahoo’s for dinner. I departed directly from Wahoo’s and drove to Walden and arrived at the NP Inn at around 9:45PM. 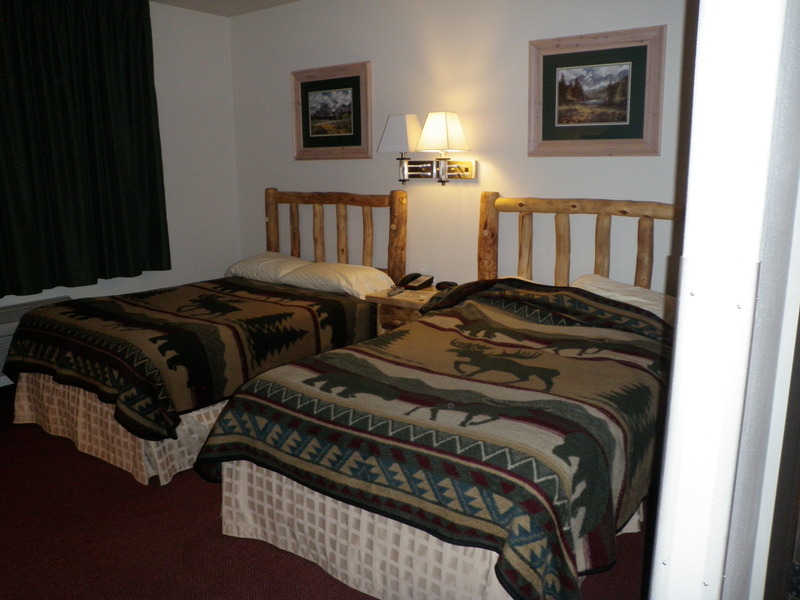 As it turned out the hotel exceeded my expectations for $75 per night including taxes. I woke up at around 7AM on Thursday morning eagerly anticipating my North Platte adventure. 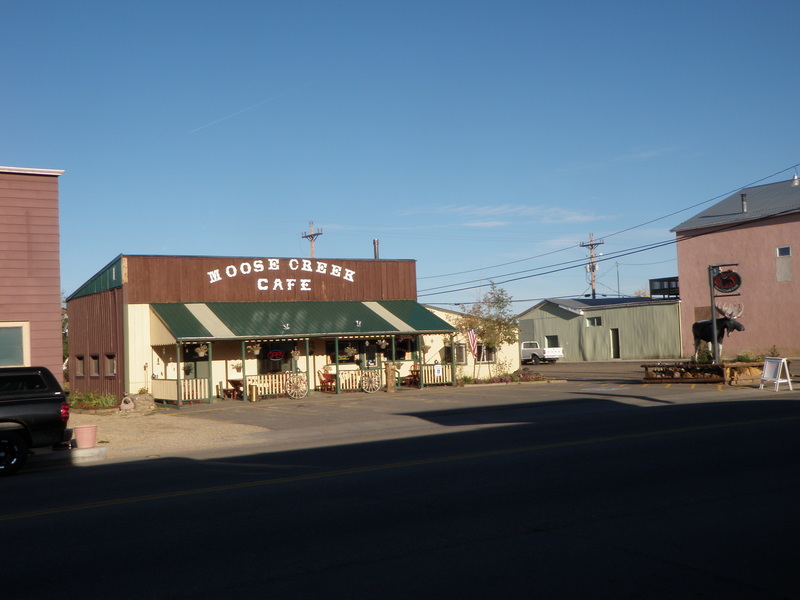 I drove a short distance from the hotel down the main street and decided to have breakfast at the Moose Creek Café. There was a large group of fishermen having breakfast so I was concerned I’d have a lot of competition in the canyon. After a hearty breakfast I walked over to the North Park Angler fly shop and the breakfast group was milling about the store purchasing flies and preparing to fish. The owner came over to greet me and helped me purchase five sinking tricos. I commented that I would have some competition in the canyon, and he told me that the group was fishing private water, and I’d likely have the canyon to myself. As I drove back to the hotel to gather my belongings and check out, I looked at the dashboard thermometer, and it was 19 degrees. That’s Fahrenheit not centigrade! I took off and made the twenty minute drive north to the Northgate trailhead and arrived at around 8:40AM. It took me awhile to organize all my gear for a full day in the canyon…lunch, raincoat, flies, etc. A year ago I put my fishing gear in my backpack and hiked the trail, but getting to my target stretch of water involved a stream crossing, so I elected to put on my waders and hike in fully geared for fishing. It was 25 degrees on the car at the trailhead so I wore my fishing gloves and several layers under my waders. By the time I’d sorted through my flies and embedded additions in my front pack my fingers were curled up and barely functional from the sub-freezing temperatures. I began my hike and welcomed the body heat I was generating from walking at a rapid pace. 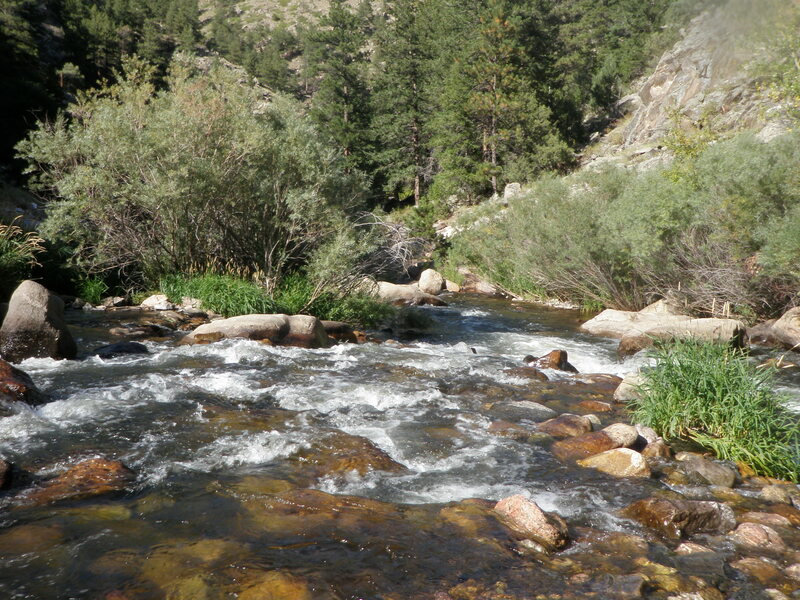 My previous trip paid dividends as I knew approximately where I needed to cross the river to the opposite bank, and then I hiked downstream a considerable distance to the last stretch of boulders and deep pockets and runs before the river widened out into a largely barren shallow stretch. In addition to the cold air temperatures, the wind was whipping down the river through the canyon adding wind chill as I struggled to tie a yellow Letort hopper on my line and then a beadhead hares ear. I prospected the first series of pockets and runs below mid-stream boulders with no luck and skipped through some flat nondescript water to the next boulder area. 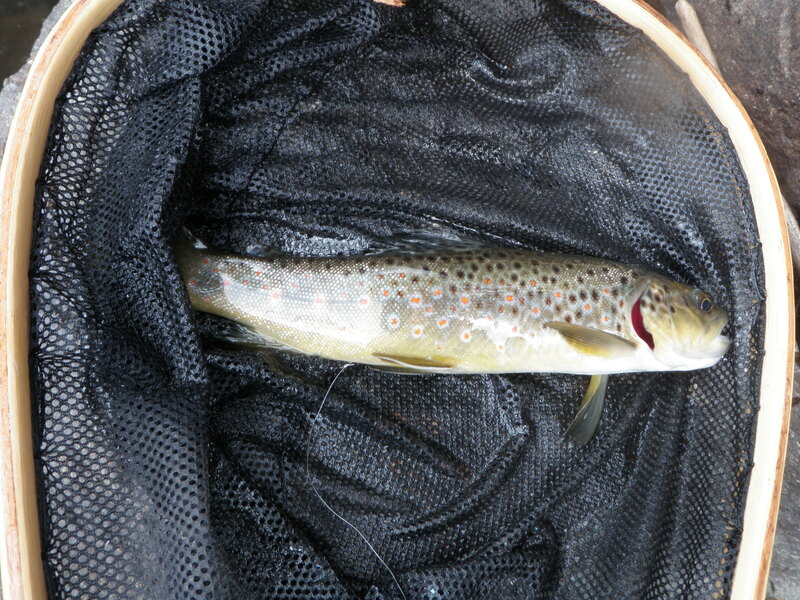 Here on a drift along a current seam a 10-12 inch brown grabbed the trailing hares ear, and I was on the board. Little did I know that my North Platte adventure had pretty much peaked at this point. 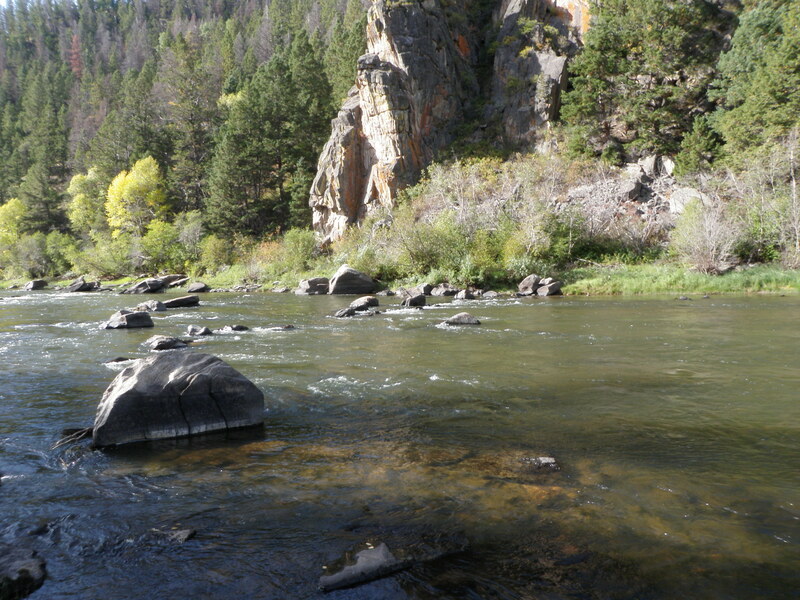 I continued up the river to the next attractive boulder area and on one of the drifts on a current seam, the hopper darted to the right and I set the hook and felt the weight of a substantial fish. I played it for a minute or two when it made a change in direction and both trailing flies popped off. I didn’t feel like I made a mistake with the amount of pressure I applied, so I attribute the lost fish to a bad knot. Given the cold temperatures and the long buildup, I was quite disappointed with this turn of events. I moved up the river again to a spot where several currents merged to form a nice deep run between several large boulders. I replaced the hares ear with a beadhead pheasant tail and cast to the sweet spot at the top of the run. As it drifted by the boulder on the left I noticed a refusal and then on the second cast a large fish rose, inspected and refused the hopper. I continued to cast and cover the area and then brought a cast back to the left so that the drift was similar to the first two. I could see the larger fish rise and this time it broke the surface. I set the hook and again I was attached to a substantial fish. This time as I played the fish I felt the telltale skip as I believe the fish shed the initial hook and the trailer found its mark and eventually the trailing hook was no longer attached as well. This fish may have felt larger than it actually was due to foul hooking, but I was upset nonetheless. Once again after covering the area thoroughly I moved to the next boulder field. After working the side that I was on, I waded to the center of the river to fish a nice run that ran within ten feet of the far shore. I replaced the pheasant tail with a shiny bright green caddis pupa fly that I tied this winter after seeing it demonstrated at the fly fishing show. On the fourth or fifth drift along the outside current seam a fish grabbed the bright green pupa and charged downstream. I let it run and when it slowed down applied some side pressure to bring it across and below me. As I did this the line released and flew back toward me, and I discovered that the caddis had broken off and I noticed the telltale curly line that signifies a poor knot. At this point I had landed one out of five fish hooked and lost a bunch of flies, but at least I was experiencing sporadic action. At noon I waded to the opposite shore and found a large flat rectangular rock surrounded by water and sat down on the edge and ate my lunch. It was still quite chilly with a cold breeze blowing up the canyon on a fairly frequent basis. I didn’t really see much insect activity on the water. After lunch as the sun climbed higher in the sky it finally warmed up a bit and I began to see some midge activity. During the two hours after lunch I switched to a strike indicator with a beadhead hares ear and RS2 and worked the likely spots deep. I got snagged on the outside of a deep run and lost my flies once and rigged the entire system again. At another point I tied on an olive and black woolly bugger and did some streamer fishing in a large deep pool. I finally reached the area where I had success in 2010 on sunken tricos, and I was certain that I could pick up a bunch of fish on BWO’s or RS2’s. It was now around 2:30, and I’d fished for a couple hours with nothing to show for it. Sure enough I began to spot some small BWO’s emerging in the afternoon sun. I kept working the RS2 with dead drifts and then swings but nothing was doing. 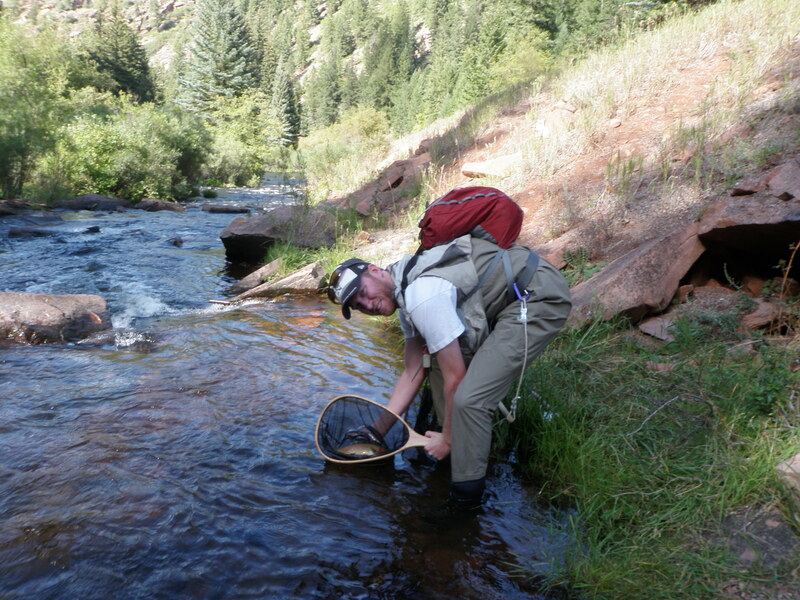 When I got above the narrow canyon where it opens up a bit, the very spot where I caught numerous fish on sunken tricos, I switched back to the hopper and trailed a light yellow caddis pupa and RS2. Here in the center of a nice run I landed an eleven inch rainbow on that light yellow caddis pupa that I’d tied on when I saw an abundance of caddis. Surely this was a sign that the fish were getting hungry for BWO’s as the emergence intensified. But alas the BWO hatch came and went and I never saw a fish rise nor could I get fish to take my subsurface BWO nymph offerings. I decided to call it a day at around 4PM as I faced a half hour hike back to the car and a 3.5 hour drive back to Denver. As I hiked out of the canyon the sun was shining brightly and it was the warmest part of the day. I had a few chances for decent fish, but I was quite disappointed with the quantity of fish. The highlights of my time in the canyon were a bald eagle that flew above me late in the morning and two dragon flies that perched in my net and stayed with me for an hour or so as I waded upstream. I can only assume that I served as a valuable wind breaker for them as they tried to extend their lives in the chilly temperatures. After weathering the Thursday rain and discovering the missing rod and flies, I decided to drive to Basalt to call Jane and possibly stop at Taylor Creek Fly Shop and purchase some green drakes. By the time I reached Basalt however the fly shop was closed, so I called Jane and asked her to bring the green fly box and Sage rod. 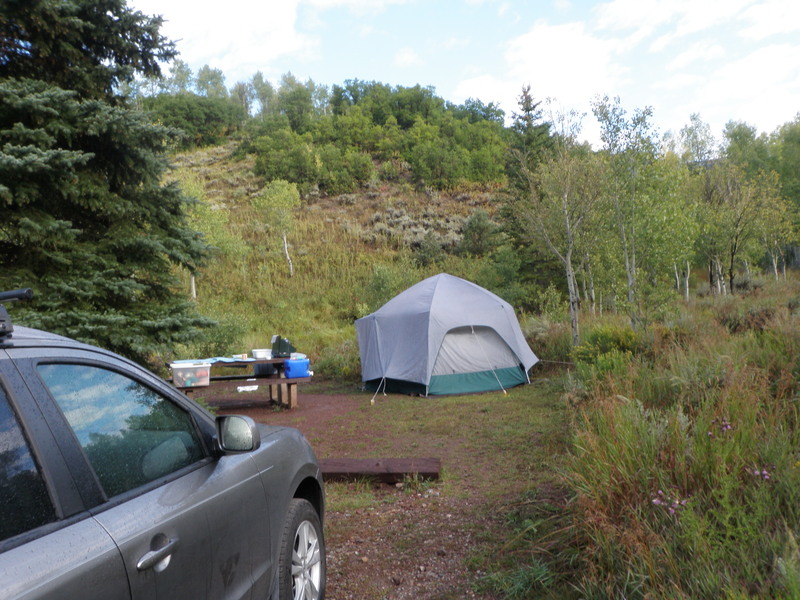 I drove back east to the Ruedi Reservoir Campground and snagged site no. 10. By the time I put up the tent it was dark and I prepared dinner by the light of my propane lantern. I awoke on Friday morning to the sound of rain once again pounding down on the tent, but it stopped by around 8AM, and I noticed some blue patches to the west. I took my time getting ready to fish as it remained quite overcast and chilly so I arrived at the pullout and began fishing around 10:30AM. As usual there were quite a few fishermen occupying the prime spots already. I pulled on my waders and wore my raincoat in case of rain and for added warmth. I parked in the first pullout above the long private water and hiked down the road to the spot where several large fallen trees span most of the river at the bottom of a long run. Another fisherman had crossed and was fishing the obscure left channel facing downstream. I rigged up with a strike indicator, split shot, beadhead hares ear, and beadhead pheasant tail and began fishing the tail of the long run. 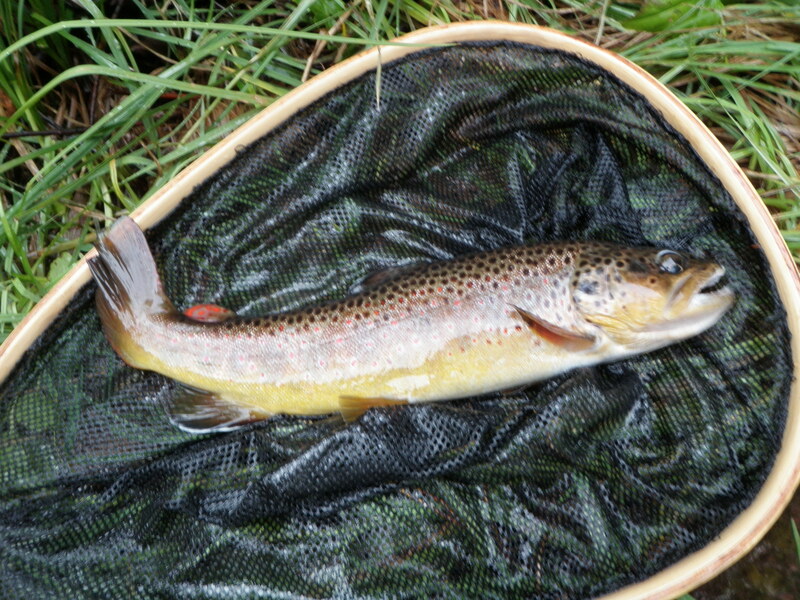 I landed a small brown on the pheasant tail and then continued working upstream next to the road. While I was doing this, another fisherman arrived and positioned himself between me and the bottom of the small narrow island just downstream from the car. 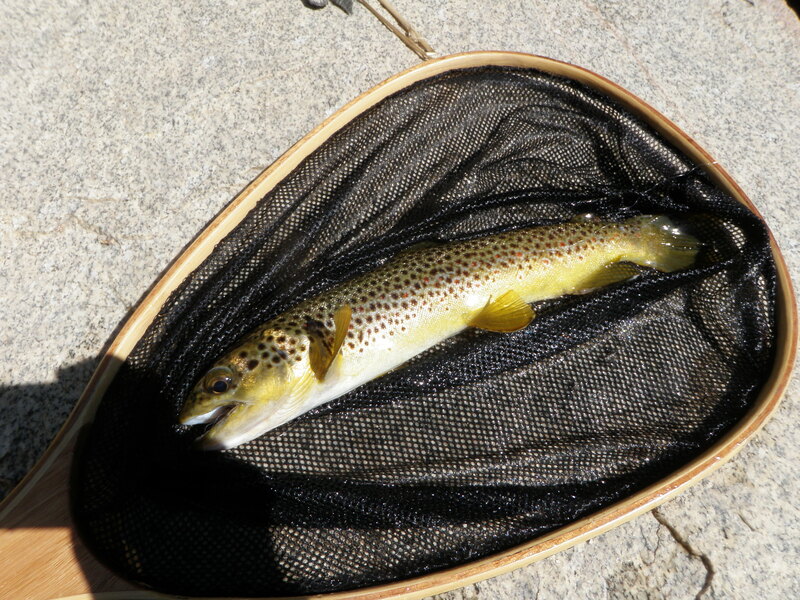 I picked up one more small brown on the nymphs as they swung from the far side of the center current. At 11:30 I decided to return to the car and eat lunch in case hatching began earlier with the somewhat nicer weather and also because my upstream progression was blocked by a couple fishermen. 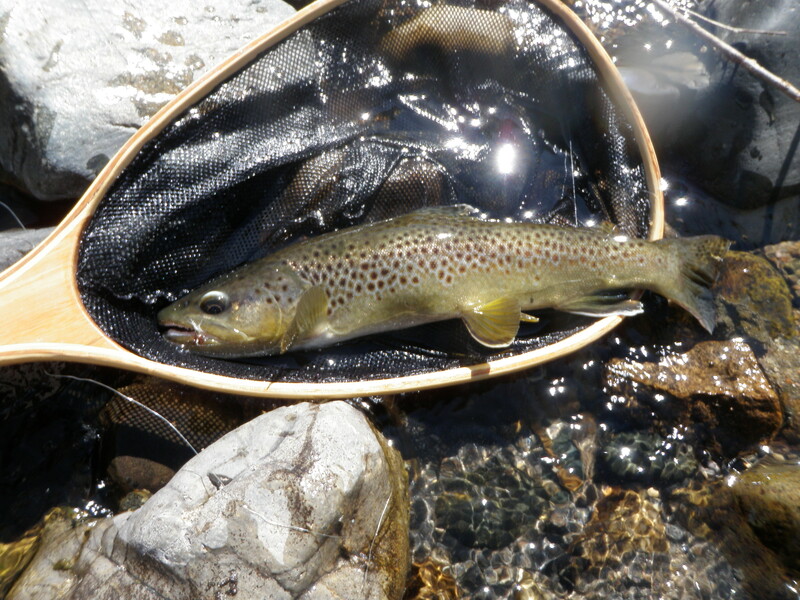 As I walked along the road I looked down and spotted a nice brown trout in a small pool near the bank. Another fisherman had waded out to the middle of the river 50 feet beyond the spot holding the fish, so I quietly slid down the bank and made a few casts to the targeted trout, but received no response. I gave up and headed back to the car and prepared my lunch. After lunch I decided to wade across the bottom of the island above where the car was parked and then to fish the south channel up to the nice pool with the huge cube rock at the head. I didn’t want to stray too far from the car as I expected the rest of the family to arrive at some point with my newly tied green drakes. Hopefully they would arrive before the green drakes commenced their emergence. I used my wading stick to print Dave Upstream in the sand and gravel behind the Santa Fe and set off as planned to cross below the island. The water below the pool was mostly fast with a few obscure small pockets. I still had my nymphs on and the strike indicator had slid down so it was only a couple feet above the top fly. 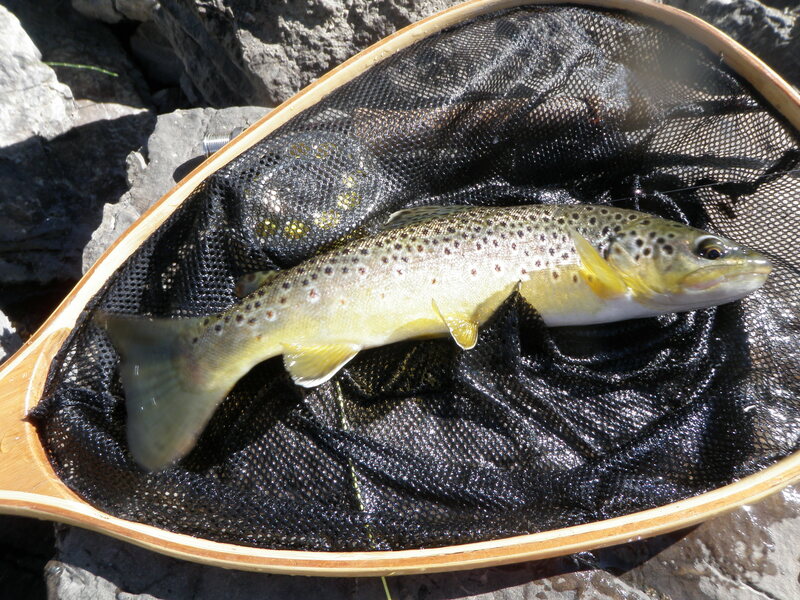 I dropped casts in every bit of slack water as I moved up along the south side of the island and caught four trout in the 9-12 inch range and in addition had a couple long distance releases. One of the fish fell for the BHHE and the others preferred the BHPT. By the time I reached the sweet pool at the top of the channel, two other fishermen had moved in so I crossed the island through the willows to the top of the north channel. I thoroughly covered the pockets at the top of the left braid and then dropped back to the top of the right channel above the pool and worked some more deep slots and pockets with the nymphs. These large deep pockets at the top of the island are some of my favorite places on the river, but I couldn’t interest any fish in the nymph offerings. I decided to move back down to the bottom of the north braid and fish back up. This water is generally tough with very skittish fish and that proved to be the case on Friday. The water was slower and shallower so I clipped off the nymphs and tied on a hopper and beadhead RS2 initially. 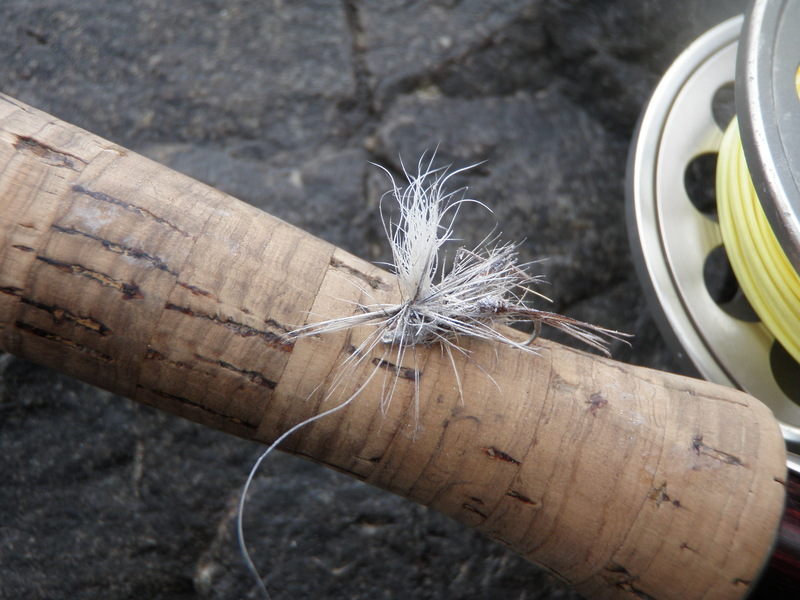 Several small fish refused the hopper, so I decided to remove the RS2 and try a gray deer hair caddis. This combination didn’t produce and more fish began to rise sporadically. Toward the top of the long pool I spotted quite a few rising fish including one that appeared to be of decent size. I also spotted a green drake or two tumbling off the surface. Dang, the green drakes were emerging before my new flies arrived. I had four green drakes in my front pack. One was a comparadun using gray olive sparkle yarn as a body, but tied on a regular size 12 hook. A second comparadun had an olive body with maroon ribbing, and this one also seemed to be undersized. 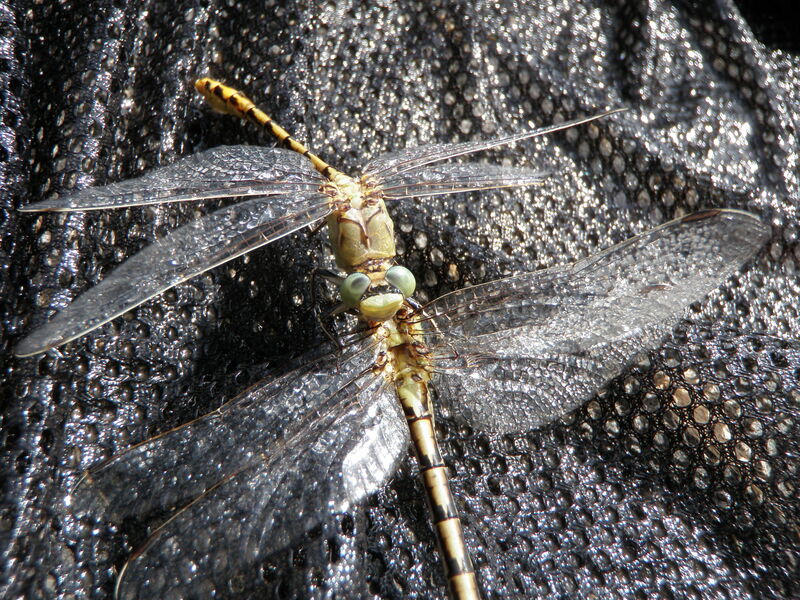 The other two were parachute style green drakes with white split wings that I purchased at the Conejos River. I tried the sparkle yarn comparadun first and landed a small brown in the faster current at the head of the pool. However the nicer brown across and down inspected but would not take this fly. I tried the olive/maroon rib fly and received the same disrespect. The purchased parachute drakes didn’t even draw a look. In frustration I gave up on the selective brown and climbed back to the road and headed back to the car. I added a fleece under my raincoat at lunchtime, and I was still comfortable in these multiple layers. I circled back down below the car and crossed out the upstream scrawl in the gravel and drew an arrow pointing downstream. I returned to the nice brown that was visible from the road that refused my offerings earlier. As I stood and watched several fish rose near the brown and then the brown zipped from the bottom to the top and inhaled an emerging green drake. At least I knew what this guy was eating. I tied the sparkle yarn undersized comparadun back on my line and pushed the deer hair wing back as hard as I could to make it nearly upright and fanned out the hair. Much to my surprise on the fourth or fifth drift the brown rose and took in my fly. I played and landed number eight and took a photo before releasing it back into its lair. Next I decided to walk to the bottom of the narrow island at the top of the long run and probe the small pockets on either side. I had just descended the bank and was preparing to fish when I spotted a black Nissan Rogue passing on the road. That was Dan’s car so I scrambled up the bank and met the rest of the family. Apparently Jane was a bit miffed as I appeared to be more excited to get my rod and fly box than to see them. 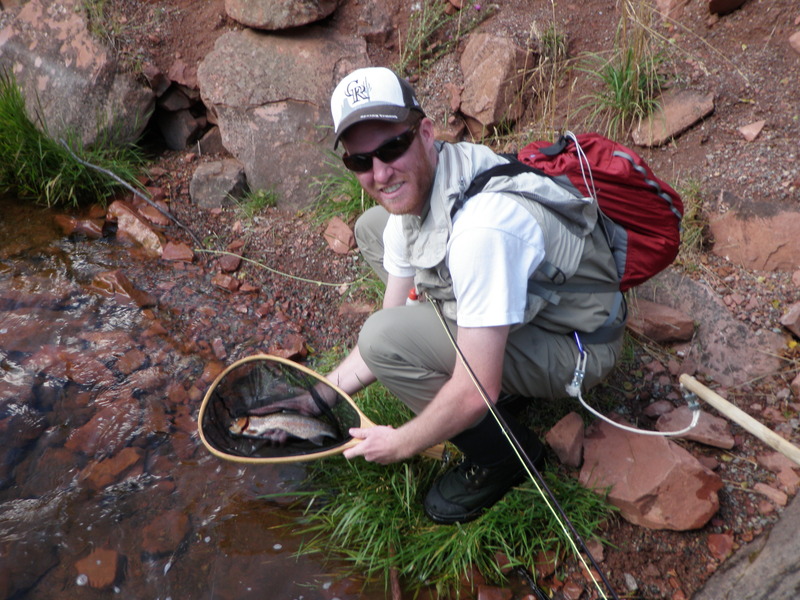 Dan decided to stay and fish while Jane and Amy took his keys and returned to Basalt and then drove south to Aspen. I quickly extracted four or five of the new comparaduns and hooked them in my front pack patch while Dan grabbed his fishing gear and prepared to fish. I returned to the bottom of the island and with the first cast of the newly minted drake landed a fish. 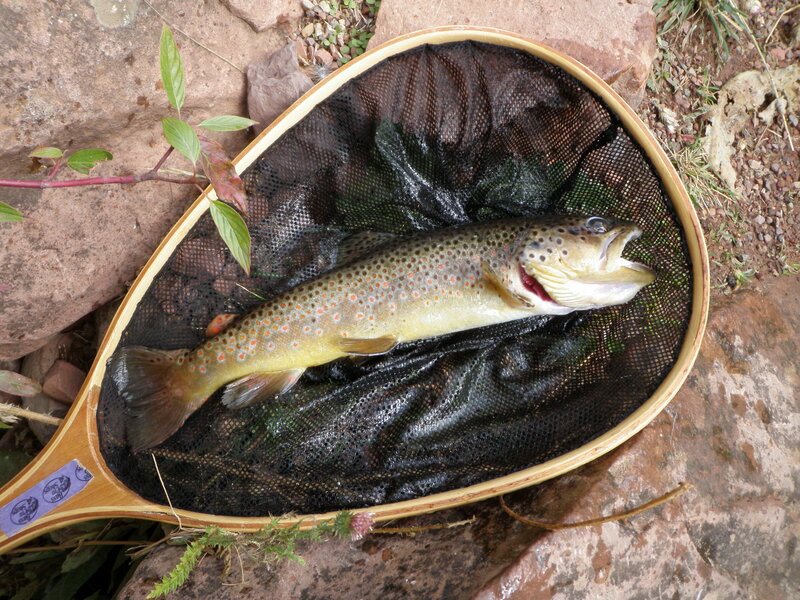 The next fifteen minutes were magical as I landed another three browns before Dan descended to join me. I tied one of the new green drakes on his line. We were both now just below the pool where I’d caught the nice brown earlier and there were quite a few fish rising above and between us. I also noticed an increased number of PMD’s hovering above the riffles. In a short amount of time Dan shot a cast upstream and hooked and landed a nice fish on the green drake. Perhaps the fly box had arrived in the nick of time. But as I cast to risers I no longer received the confident slurp that I’d experienced fifteen minutes prior and neither did Dan. I switched to a gray comparadun (money fly) and landed a 13 inch brown at the lip of the pool between Dan and me. Dan was working up along the bank and not getting any action on the green drake so I eventually converted him to the money fly as well. When we’d fished out the decent water in this area, I suggested we go up the road to the top of the island and see if fish were rising there. Sure enough we spotted several risers close to the bank at the top of the left channel, and I gave Dan the water and encouraged him. 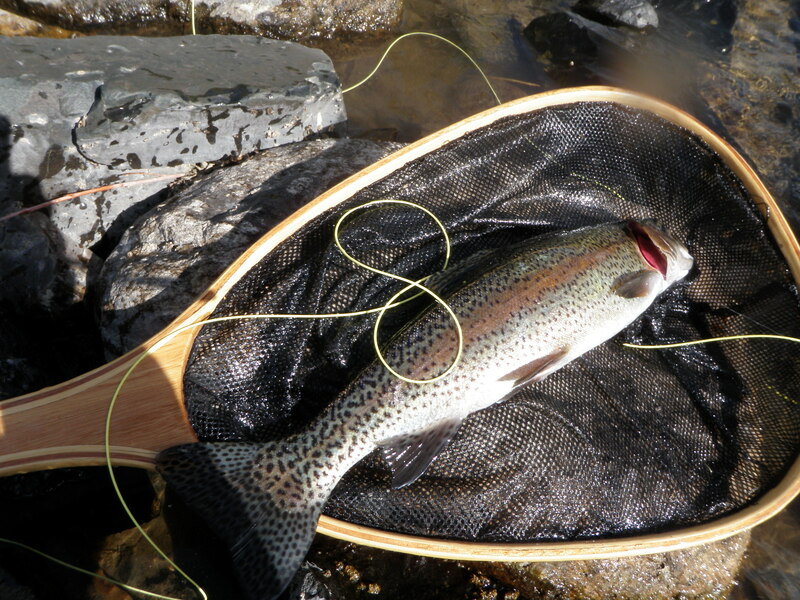 Eventually he landed a nice rainbow that rose in the seam below a large rock above the island. It was now getting late in the day, probably 4PM or later and the shadows were covering the south half of the river so I suggested we walk up the road and check out the big pool at MM12. Two fishermen were in the long wide pool at the big pullout and bend, but there was a bunch of wide open water in the cascading riffles above the bend pool. 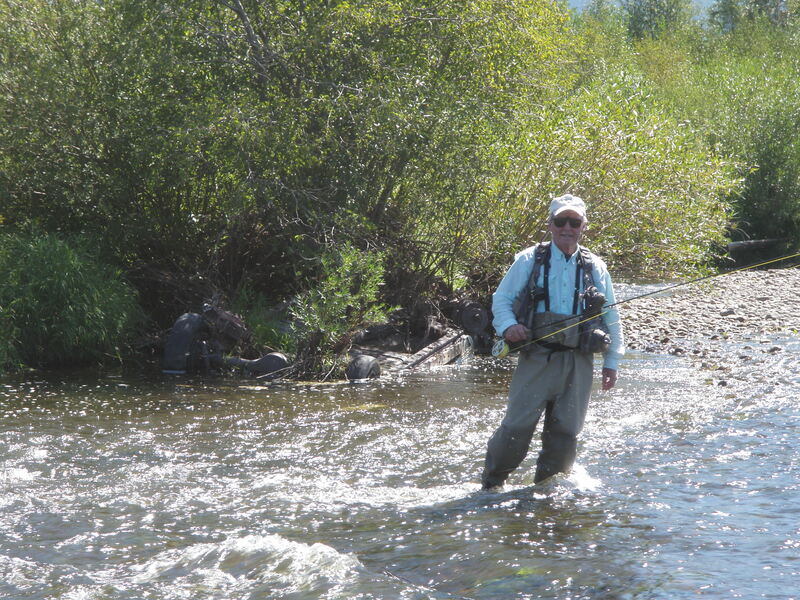 Dan began casting to the riffles and I went downstream a short distance to the long eddy behind the rectangular rock that protrudes into the river. I stayed low and crept out on the rock and spotted at least three nice fish facing downstream into the eddy as the current reversed and came back along the bank to the rock. One of the fish was rising deliberately so I carefully fluttered the comparadun into the eddy. 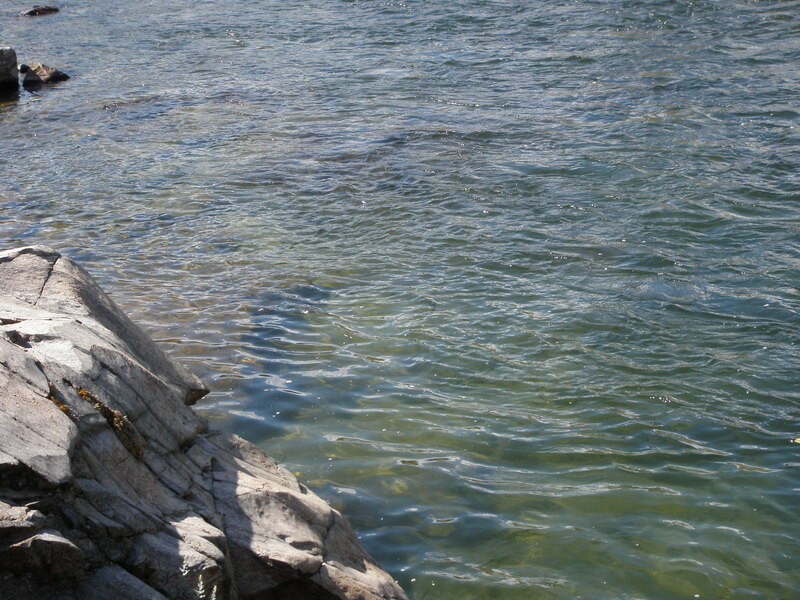 On the second cast as it drifted back toward me and the rock, a beautiful brown rose calmly and sipped it in. 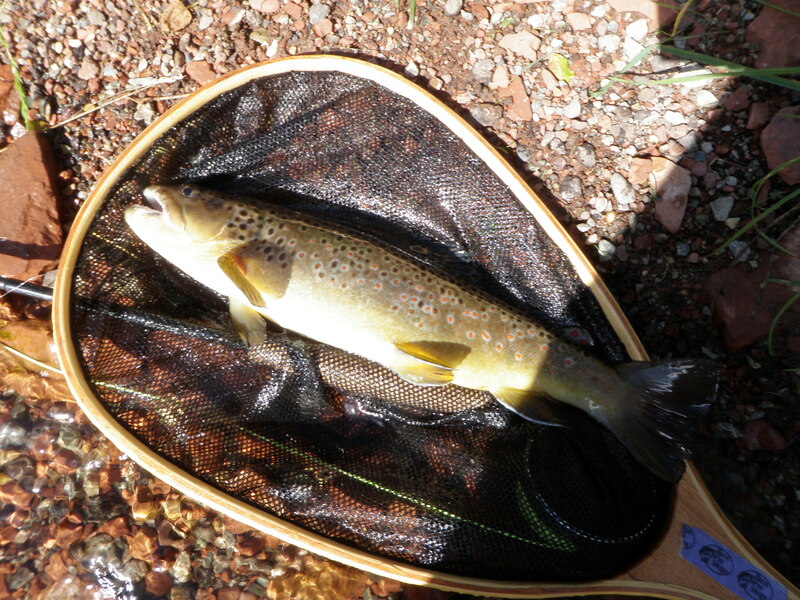 I played it quickly and landed and photographed probably the largest brown I caught in 2011. After releasing the big guy, I returned to Dan and watched him cast and receive a few refusals. At around 4:30 I suggested that we return to the rock and see if the fish had returned to their feeding stations. We both crawled out on the rock and picked out at least three nice fish in feeding positions. I gave Dan the position farthest out on the rock to get a better angle. Dan sight fished to the fish and over the next half hour landed two nice fish and hooked and lost a third. It was very exciting to watch Dan place his casts and then see the fish rise and take his offerings. Dan ended up with five trout landed, several quite nice, in two hours of fishing. Amy was visiting us for a week so we planned a family camping trip for Thursday – Sunday. 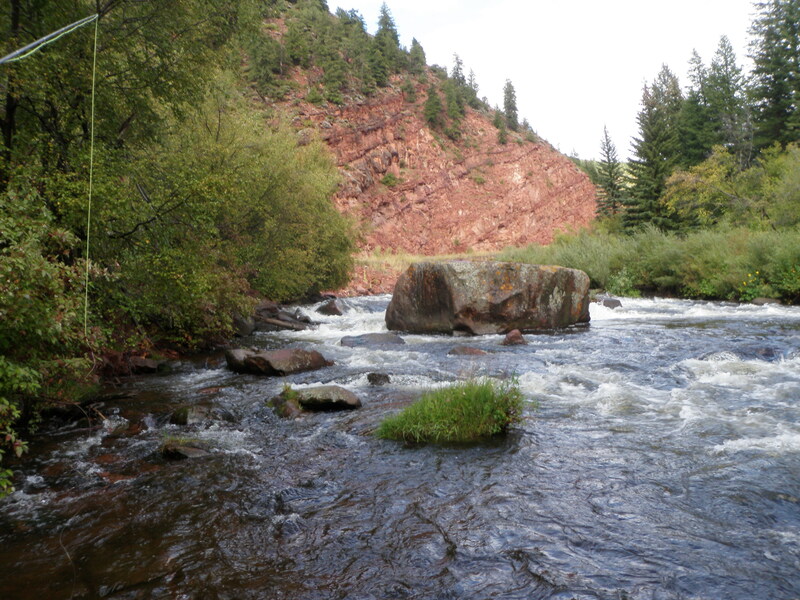 We chose Ruedi Reservoir as our destination as this would give me a chance to fish in the Frying Pan River, and there are several hiking trails in the area that we enjoy. I packed the Santa Fe and took off by 8:45AM on Thursday morning. 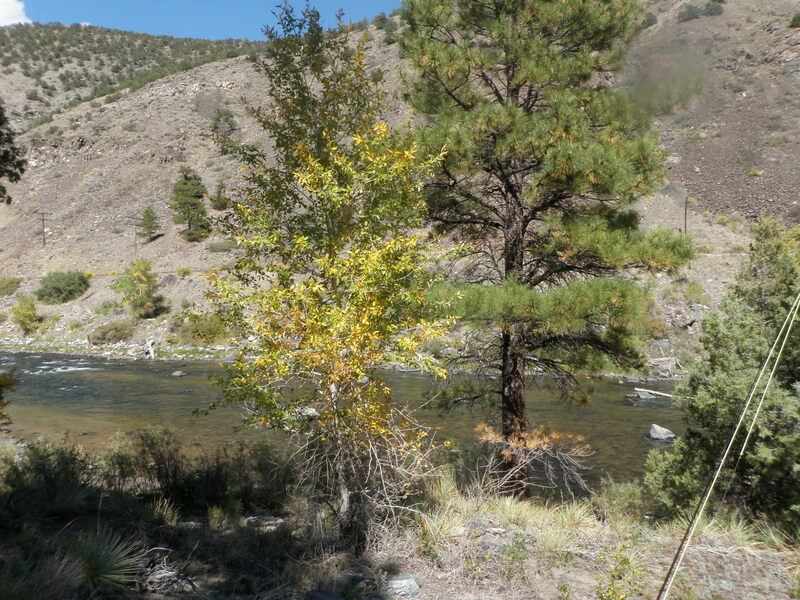 After stopping for gas along I70 and lunch in Glenwood Springs, I arrived along the upper Frying Pan River and was on the water fishing by 1PM. On my drive it began to rain in Glenwood Canyon and continued off and on until I parked along the river. When I began fishing it was raining quite hard and this would continue until around 4PM when the clouds broke and the sun appeared in partly cloudy skies. I had tied six new green drake comparaduns on Wednesday evening before dinner and I was eager to give them a try. I modeled them after one that I purchased on the Conejos River; however, they were sparser as I did not add the dense hackle behind the wing that characterized the purchased model. I did however use crinkled moose mane for the tail and matched the abdominal color and ribbing exactly as well as the size of the fly. I searched through my fishing bag for the green fly box where I stored the new green drakes. Alas it wasn’t there. I’d left it behind on my fly tying desk in the loft. Next I looked for my four piece Sage 4 weight rod, my favorite rod for the Frying Pan. Apparently that continued to reside in my garage. Fortunately I had my Loomis five weight and Scott six weight, so I could still fish. I parked fairly high up on the upper Frying Pan River near the road that crosses the river and provides parking for fishing right below the dam. I walked down the road quite a ways until I encountered another fisherman and slid down the bank in the rain 50 yards upstream. The flows were at 300, and this is somewhat high for this fairly narrow stream bed. 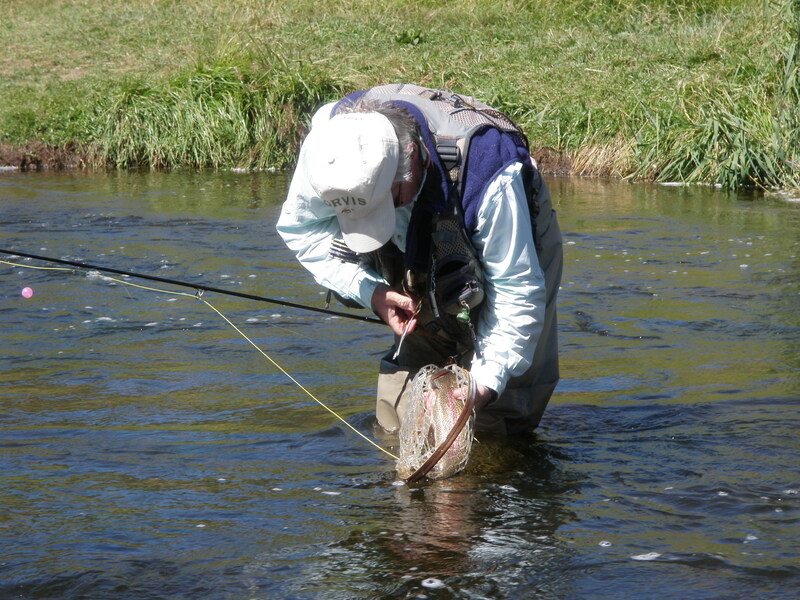 This meant the holding spots for trout were fewer than at lower flows. 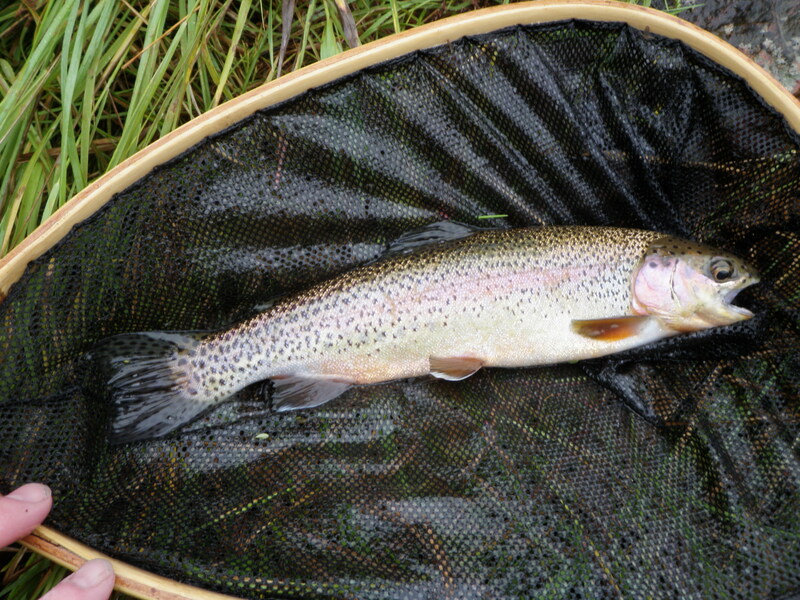 I began fishing with a Chernobyl ant and beadhead hares ear and caught a nice rainbow on the Chernobyl in short order. As I worked upstream a lack of action caused me to switch to nymphing with a beadhead pheasant tail and RS2. I managed to catch a brown on the RS2 before all manner of hardship descended upon me. First I wrapped the flies around the tip of a long branch that arched out over the river. It was impossible to retrieve these flies, so I broke them all off. The leader separated at the last knot attached to the tapered leader, and I’d broken it off enough times that the end diameter was getting quite thick. Against my better judgment because of my eagerness to fish, I tied on new sections of tippet to the tapered leader and then added split shot, indicator, and two flies. In short order I got hung up on a stick or rocks and when I gently jerked the rod to free them, the entire set of flies broke off again at the first knot. Now I decided I needed to replace the entire tapered leader. During the process of unraveling the tapered leader, I created a bird’s nest again through impatience. I probably spent at least an hour messing with my leader and knot tying and not fishing. I eventually worked through this and landed three medium sized fish on the nymphs; one on the pheasant tail and two on the RS2. It became apparent why the RS2 was producing as I began to observe BWO’s mixed with a few PMD’s. This occurred around 3PM, and I switched over to a CDC BWO and landed three on this fly in the pouring rain. Even under dry conditions it takes me awhile to dry the CDC wing and fluff it up, but during the steady rain this became an even more difficult chore. The rain ended at around 4PM and this created a brief flurry of PMD emergence. I switched to the gray comparadun (money fly) and landed two above the car. When I ran out of decent stream to fish above the car, I walked back down the road to the open riffle area above mile marker 12 and by this time most of the fishermen had quit for the day so space was available. I landed a twelve inch rainbow in this area on a gray caddis. On the day I landed eleven trout and the largest was perhaps thirteen inches, but I caught three or four of these. 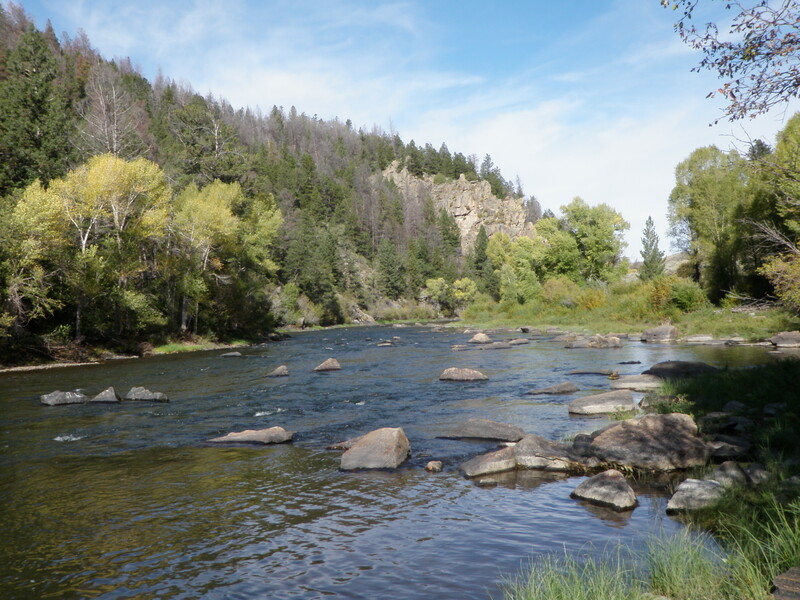 I was disappointed with the size of the fish I caught on the Big Thompson on Saturday, and I was itching to visit the Arkansas River for some September fishing. 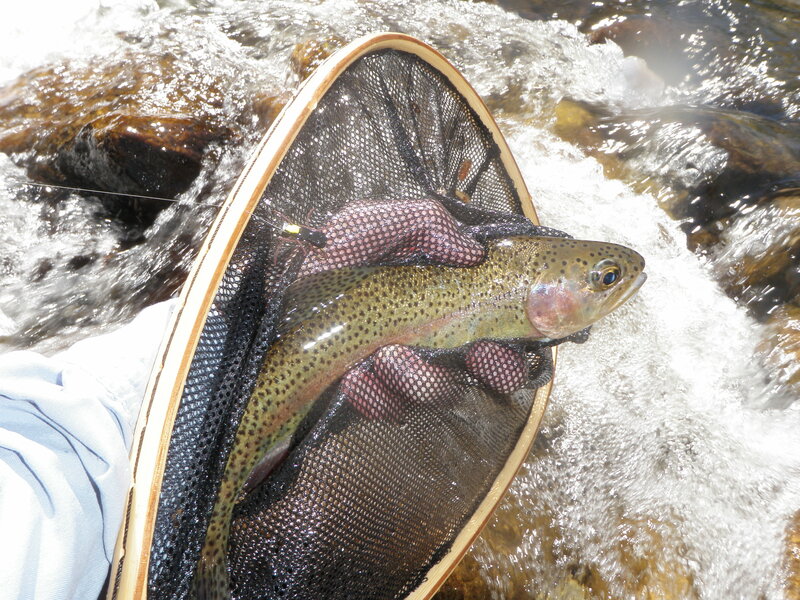 The reports from the fly shops were encouraging and the flows were ideal. Amy and her roommate Joe were visiting, and they wanted to tag along and do some hiking while I fished so we planned a trip for Tuesday, September 13. We got up early and were on the road by 7:15AM. 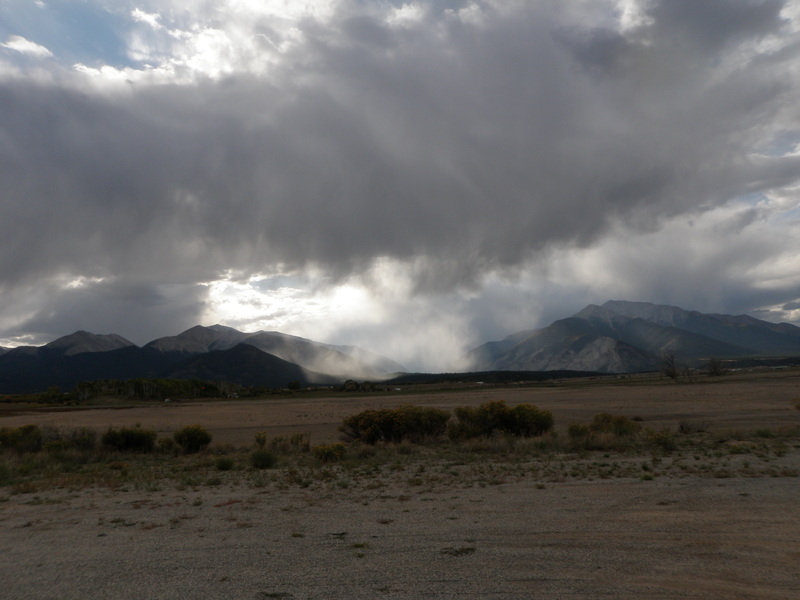 It was quite cool and overcast and the temperature registered high 40’s on the mountain passes on the trip to Salida. It would remain cloudy most of the day with the sun peeking through intermittently between noon and 2PM. I parked at the pullout just east of the Fremont-Chafee county line and put on my waders and gathered everything I would need for a day of fishing without access to the car as Joe and Amy were driving toward Cottonwood Pass and hiking to Ptarmigan Lake. I said goodbye and hiked down the path to the river below the cable and crossed at the bottom of the long pool. I then walked along the railroad bed to a point below the island and angled down to the river. I began with a Chernobyl ant and a trailing beadhead hares ear and cast to the deep run below the island. My first action included two temporary hookups on the Chernobyl ant, but both fish got off before I could apply any pressure. In the riffles below the channel on the right side of the island, a rainbow grabbed the BHHE and I was on the scoreboard with one fish. I worked up along the left side of the small island and landed a small brown near the top, but the water was largely unattractive. I retraced my path to the base of the island and covered the right channel. In an unusual change from previous experience I failed to land any trout from the right channel. I probably experienced five or six refusals to the Chernobyl ant and startled a few nice fish from their lies along the edge. When I reached the top of the island I took time to swap out the Chernobyl for a yellow Letort hopper. I landed two more twelve inch rainbows along the right bank between the top of the island and the tail of the long pool across from where Amy and Joe dropped me off. I covered quite a bit of real estate so the fishing was quite slow. Since I had my lunch in my backpack, I sat down on a rock just below the long pool and munched while observing the water. The river was largely barren of any aquatic insect activity. After lunch I climbed up the bank to the rail bed and skirted the long pool. A dad and two boys were fishing from the other side, and I didn’t want to disturb them, and I was looking for pocket water not a long smooth pool. I resumed fishing at 12:45PM and remember looking at my watch at 1:30 and thinking that I was averaging less than two fish per hour and it was turning out to be a dud of a fishing trip in spite of the nice overcast conditions. In my mind I was debating switching to deep nymphing in the faster runs and channels, but as I was doing this some denser darker clouds rolled in and the wind picked up and it felt like rain was imminent. I put on my raincoat anticipating the rain and tied a small RS2 to the BHHE. Ahead of me was a nice long side pocket between a strong run and the bank. I made a 25 foot cast, and a fish rose and smashed the hopper. I played a decent rainbow to the net and moved up a few steps and punched a cast into the wind to the top of the pocket. Wham! Another rainbow attempted to inhale the hopper. Amazingly as the weather got worse, the fishing got better. I’ve observed this trend on numerous occasions. Next I noticed a nice wide pocket in the middle of the river behind a large horizontal rock. I flicked the three fly combination up and across to the top of the pocket and just as the hopper began to drag a beautiful rainbow grabbed the trailing RS2. I was now observing very sporadic BWO’s fluttering above the water. Perhaps the trout were tuned in to BWO nymphs subsurface? Between 2 and 3PM I landed seven very nice trout with roughly four hitting the yellow Letort hopper and the others taking either the beadhead hares ear or RS2. I also snapped off the hopper twice on rising fish and in the process lost six total flies. I’m not sure if I was setting too hard or had a bad knot attaching the hopper to the leader. After losing the second BHHE of the day I substituted a beadhead pheasant tail and landed two fish on that fly. 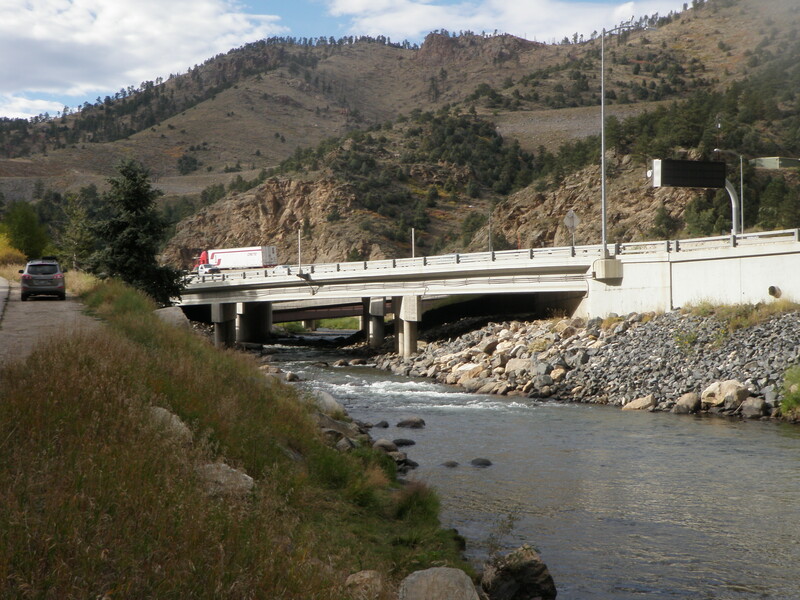 By 3PM I worked my way up the river to a point across from a wide pullout bordering a huge rock next to the highway. Another fisherman was fiddling with his line, and then I noticed he sat on the top of the bank overlooking the river and watched me fish. This required a show, so I focused on my task and landed three smaller fish along my side of the river from small pockets while he observed. I also foul hooked a nice 14 inch rainbow while he was watching. I didn’t count this fish, but as far as he knew it was another fish I landed while he was a spectator. After I landed three fish he made his way down to the river and began fishing. He moved almost in parallel with me but slightly downstream on the opposite shore. 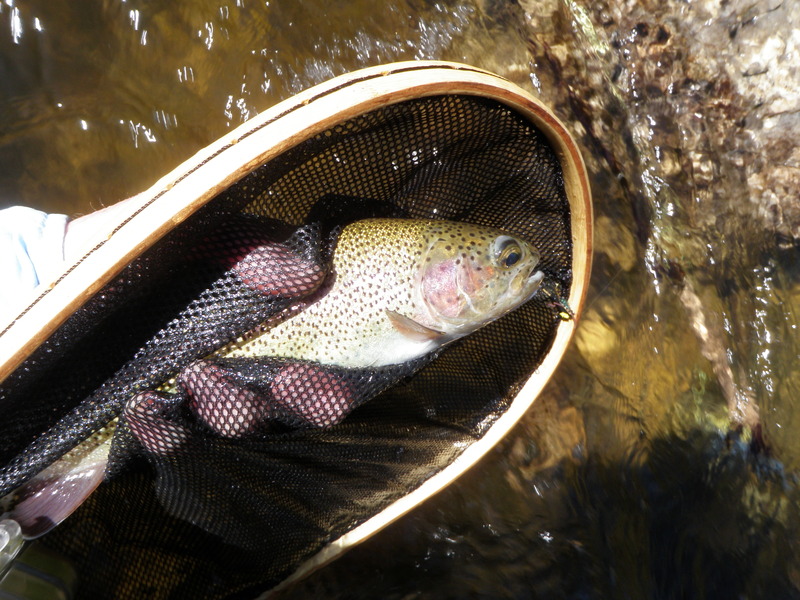 During this period of observation I landed five more trout to bring my total to 16 on the day. After a very productive couple hours in the afternoon, it was approaching 4PM, and I told Amy and Joe I’d meet them at 4, so I hustled back up the steep bank to the railroad bed and hoofed back on the railroad ties, and then waded across the tail of the long pool and up the bank to the car. Amy was reading in the front and Joe was sleeping after their high altitude hike. I told Amy I wanted to check out the river from the high rocks next to the car, so I walked down to my convenient observation point. Sure enough four or five fish were visible warily rising and feeding on something small next to and above the high rock wall. Amy came down to check things out and also saw the rising fish. I clipped off my three fly set up and tied on a CDC BWO and cast from high above the river to a nice sized rainbow that was feeding pretty actively. The wind had picked up and repeatedly blew my cast five feet to the left of my target. Finally I compensated and placed a cast above the fish. I couldn’t really see my tiny fly and it was difficult to control drag from the high casting angle, but on perhaps the sixth or seventh cast with Amy watching and poised with a camera I noticed a rise approximately where my fly would be. I set the hook and nicked the fish as it put a nice bend in the rod tip, but while Amy looked on the fly slipped out of the rainbow’s mouth and came flying back toward me. I stumbled as I protested demonstratively and that probably put down all the other fish. On that note, my fishing adventure on the Arkansas ended for the day and we made the long return trip toDenver. Of the 16 fish landed I estimate that 10 or 11 were rainbows. 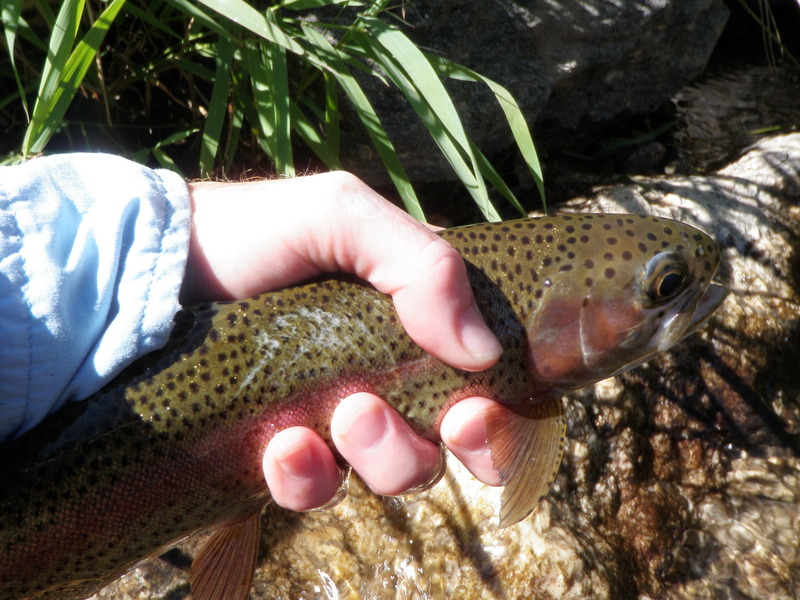 This was the second time in recent memory that rainbows outnumbered browns on the Arkansas River. 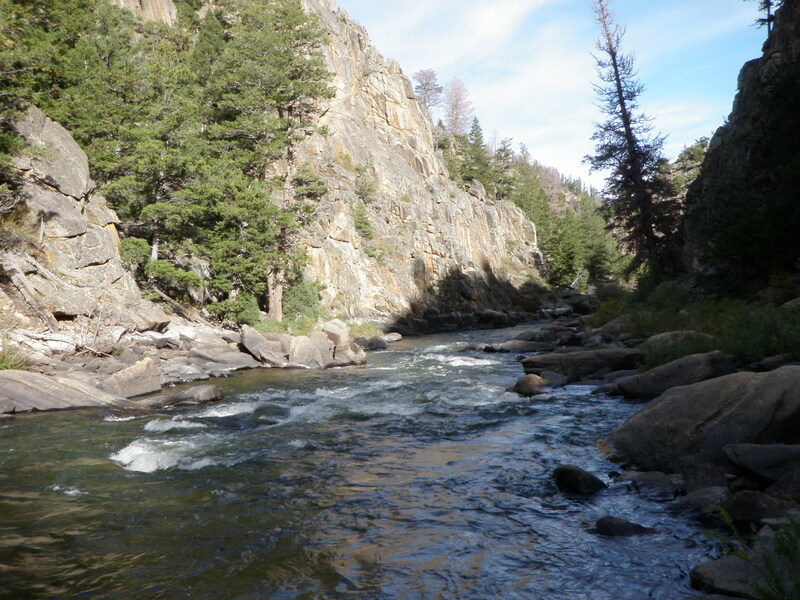 Jane and I had dinner guests on Friday night, and I got to bed too late to get up early and make the long drive to the Arkansas River as I planned, so I decided to visit the Big Thompson below Lake Estes instead. I left the house at around 8:30AM, and I was on the water fishing by 10:30AM. The flows were surprisingly high for early September, and this was confirmed when I checked them on Sunday, 150 cfs. I probably would have gone somewhere else had I checked beforehand. I began fishing at the downstream boundary of the catch and release water approximately eight miles below the dam. Initially I tied on a caddis dry fly, but this produced only a few refusals so I switched to a yellow Letort hopper trailing a beadhead hares ear. This also began producing refusals so I swapped out the Letort hopper for a Chernobyl ant. I fished a fifty yard stretch from below the bridge to the bend with only a few refusals. 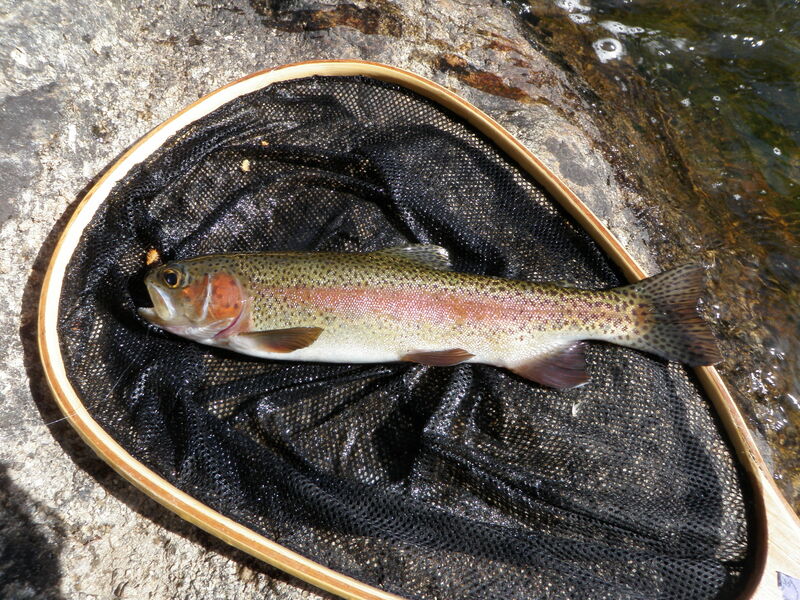 When I got to the small bend and water that was not as easy to fish from the road, I began to catch fish. The Chernobyl began producing as well as the BHHE. 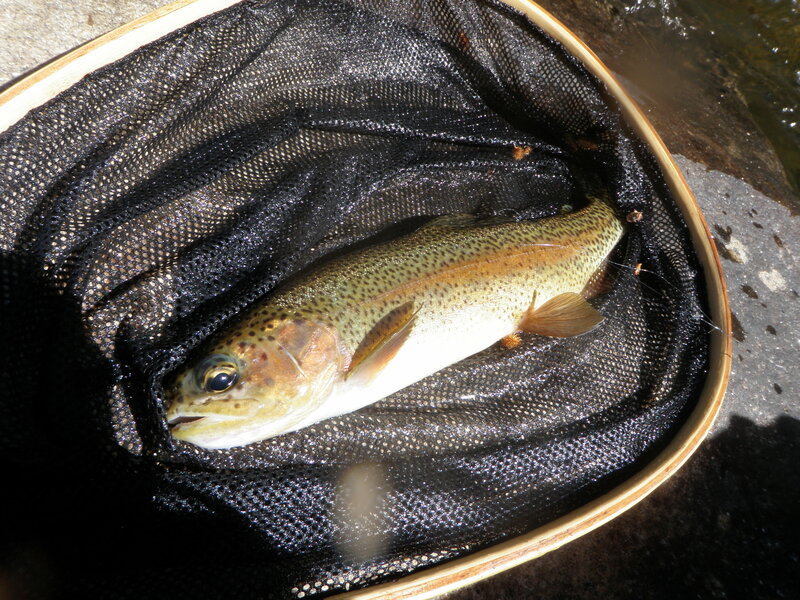 In some nice water where the stream spread out into a lot of small pockets, I began to score with increasing frequency and finally broke for lunch at around noon with a fish count of nine. These fish were predominantly rainbows with a few browns mixed in and the size was 7-9 inches. I returned to the car for lunch and decided to drive back upstream a bit and park where I would resume fishing. I ate my lunch on the rocky bank overlooking the river, and spotted several fish in an eddy opposite me, but they were in a spot that was nearly impossible to cast to from my bank. After lunch I walked down the shoulder of the road to a point above a narrow chute where white water thrashed through some rocks making fishing impossible. I continued catching fish mainly on the Chernobyl ant but with less frequency than the last hour of the morning. The size of the fish was improving and most of my catches were tight along the bank. I’m certain that I could have caught more fish if I could have accessed the south bank, but the high flows made crossing dangerous and drag free drifts with the intervening swift current were nearly impossible. Toward the end of the day I spotted a decent fish in a small pocket downstream of a boulder hugging the bank. The fish showed itself briefly when it darted toward the surface to refuse the Chernobyl ant. I patiently made a few more casts, and eventually the rainbow made a subtle move and I hooked and landed a nice fish on a small beadhead RS2. On another occasion I hooked a left handed cast around some overhanging branches and saw a rise and hooked a nice rainbow. I executed the cast and hook set entirely with my left hand. There were small mayflies emerging sporadically between 3PM and 4PM which is what caused me to tie on the RS2, but there were never enough to spur any surface feeding and I stayed largely with the Chernobyl/dropper approach. At the very end of the day I drove a bit further upstream to just below the handicapped platform and watched the water for a while without casting. I spotted many caddis and a few BWO’s, so I rigged up with a strike indicator and yellow caddis pupa and RS2 and worked a nice deep run repeatedly, but my flies didn’t receive any attention. As the shadows covered the river, I placed my flies in the hook keep and returned to the car and made the return trip. Jane wanted to leave early on Sunday to return to Denver, but I convinced her that since we’d made the three hour drive, we should stay and play in Steamboat a bit longer. It didn’t take much arm twisting, so we had a nice early breakfast at Winona’s in downtown Steamboat and then returned to the condo. The girls decided to either play tennis or go to the air show taking place. 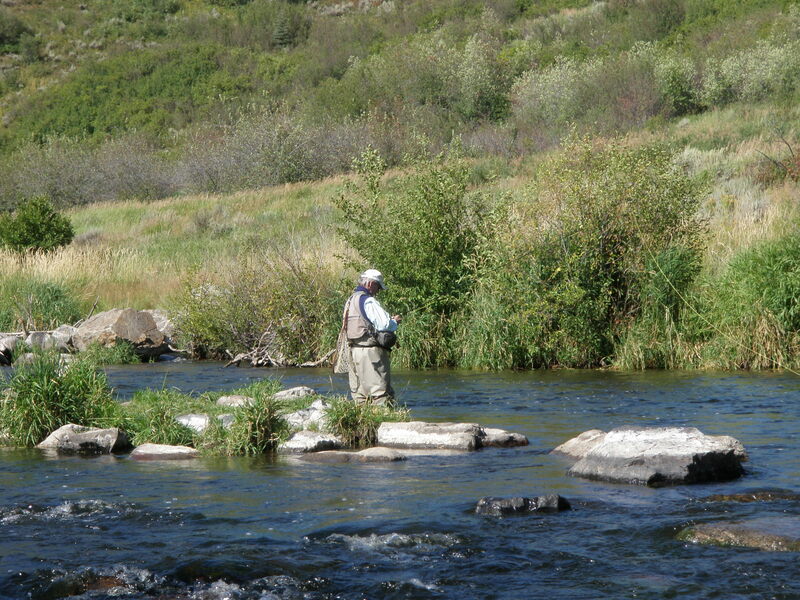 Steve and I planned to hit the Yampa at the Chuck Lewis access closer to Steamboat Springs. This was downstream from Stagecoach and Catamount lakes, but outside of town and thus avoiding the dense tube traffic that occurs in the town of Steamboat. 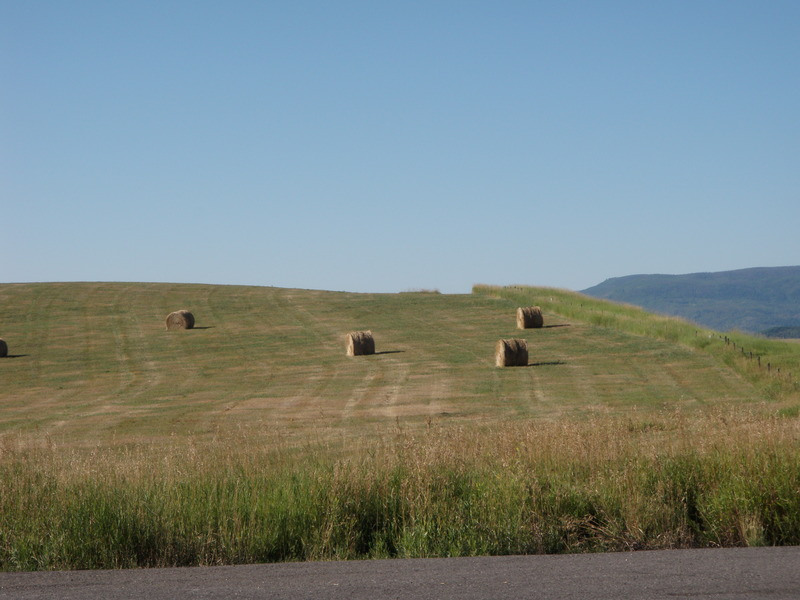 We arrived at the parking lot and wadered up and walked down the well defined path through the hay meadows between the parking lot and river. We arrived at a fork and chose the right fork only to stumble into two fishermen in a nice riffle and run stretch. We pushed back the willows and returned to the fork and hiked downstream a ways. Steve stopped below some stream improvement rocks and began to fish a beautiful run while I worked my way further downstream and crossed over then further downstream below a nice run and eddy. I tied on a yellow Letort hopper, beadhead hares ear and orange scud and began prospecting the run. Nothing was showing as I worked the riffles in the bright sunshine. Next I moved up along the bank to the eddy, and I thought I spotted a decent fish in the deepest part of the eddy. After numerous casts over the fish and switching to an RS2 as the bottom fly, I spooked the fish, so I moved on. 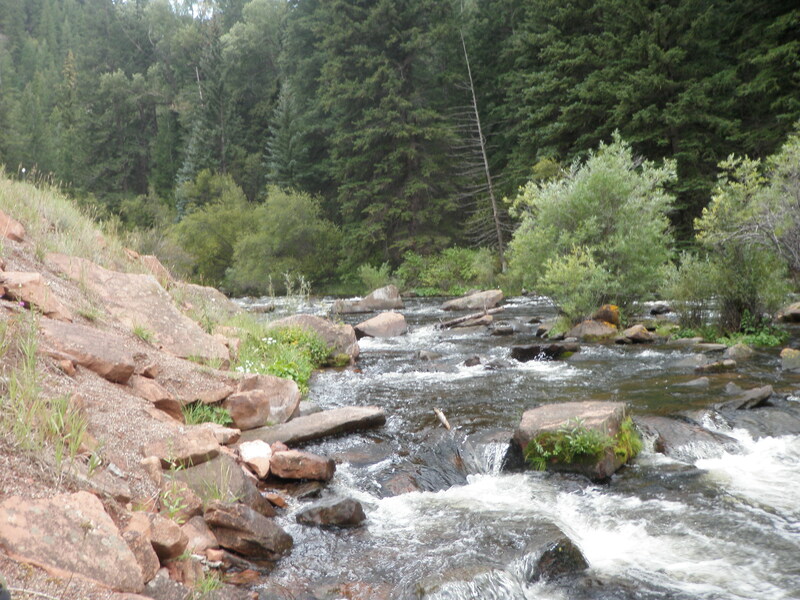 I went upstream to the nice wide riffle and run area where Steve had begun. This was fairly deep water and the dry/dropper combination seemed fairly futile. Also I was spotting the occasional small mayfly emerging in the riffles, so I abandoned the dry/dropper method and rigged up with a strike indicator, split shot, BHHE and beadhead RS2. 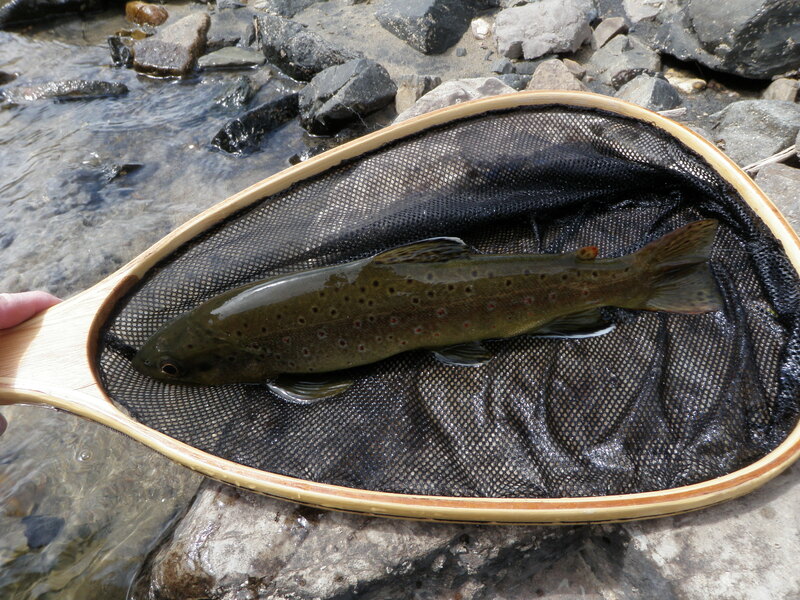 I worked the water relentlessly with nice long drifts from the whitewater at the head to below me and finally after thirty or so drifts, the indicator moved slightly and I hooked and landed an eight inch brown trout. As I brought the fish near me I could see another larger fish trailing the brown. I wasn’t sure what to make of this. Steve was opposite me and noticed numerous rising fish along the slow moving water between the current and bank. I finally gave up on the run and moved upstream above Steve and tried some water that was slower moving but did have a thin current seam through a deep trough eight feet from the bank. I worked downstream from the top to across from Steve with the nymphs and midway removed the scud and tied on a sunken trico. I had a RS2 and sunken trico combination. I suspected that the small mayflies I spotted earlier were emerging tricos and now judging from the characteristic slow steady rises felt that tricos were on the water. The sunken trico didn’t produce, so I walked back downstream to a point where I could cross back over to Steve’s side of the river and then stood to Steve’s left and slightly below him and inspected the water. Sure enough I spotted tiny tricos in the surface film. I showed Steve a couple specimens I was able to dip from the water and he found some trico flies in his trico box to try. I had one trico spinner in the bottom of my round plastic container, and I carefully removed it and tied it to my line. I was skeptical that this would work as the samples I observed were size 26 or smaller whereas the fly I had was a 22. Steve and I began to flutter casts to the current seam where at least five fish were rising but the fish were having none of our offerings. After 15 minutes of this futility I switched and put on a small fur ant with an orange tuft of poly on the back. After numerous refusals, a fish sucked in the ant, and I set the hook. As I suspected these were extremely small fish and I landed a three inch no count rainbow. Meanwhile Steve faced downstream and cast to the pod below us that had resumed rising and hooked three tiny fish. We eventually left these small fish alone and moved upstream to some fishy seams and eddies, but it was now close to noon with the sun high above and our confidence was waning so we removed our flies and hiked back to the parking lot and ended our fishing for the day. Jane and I accepted an invitation to visit Judy and Steve Supple at their condo in Steamboat Springs for Labor Day weekend. Jane got off work early on Friday, and we drove to Steamboat arriving around 4PM. 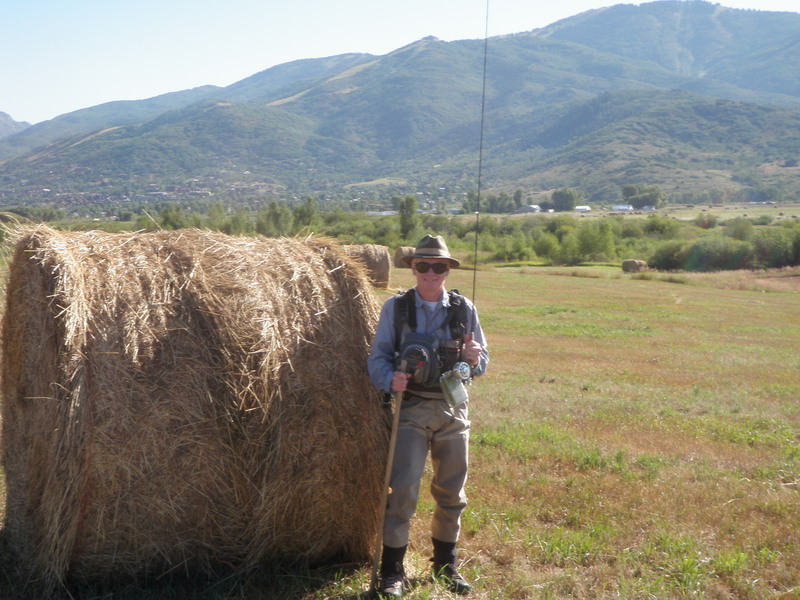 On Saturday morning Steve and I planned to fish in the .5 mile special regulation water on the Yampa River below Stagecoach Reservoir. This high quality water gets extremely crowded because of the large fish and short distance of public water. We had a quick breakfast and left the condo by 7AM arriving at the parking lot by 7:30AM. There were already three other cars in the lot so we hustled to put on our waders and rig our rods and hiked down the path to the river. There was only one other fisherman on the water so we snagged the prime run and pool in the middle of the short stretch of water. I immediately went to a strike indicator with an orange scud and beadhead RS2 and began casting in a nice run on the side of the river near the path. Steve went a bit upstream and began fishing with nymphs as well. After a bit of fishing a chunky 12 inch rainbow hit the orange scud, and I landed it in the chilly early morning. It took awhile for the sun to get above the ridge to the east and warm up the air temperature. Steve had mentioned that the fly shop in town suggested using scuds, but he had forgotten this advice. When I told him I caught the first fish on a scud, he added one to his offering. 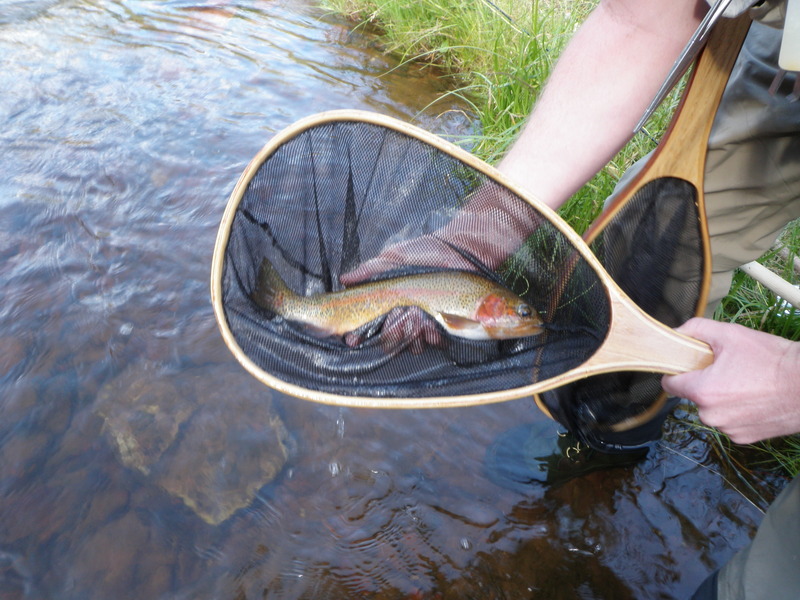 I continued prospecting with the nymphs and landed a couple more small rainbows on the RS2 over the next few hours. As the morning progressed and the sun moved higher in the sky I was able to spot nice sized fish on the bottom of the river and sight fish to them. But as I changed offerings nothing seemed to provoke their interest. I spent quite a bit of time fishing to three nice fish in front of me further downstream from my initial position at the base of a nice pool. I decided to cross over to the opposite bank and work up along that side with a Chernobyl ant and some droppers. By late morning a herd of additional fishermen had arrived and quite a few were above us. I also began to notice occasional blue wing olive size mayflies slowly flying up from the river so I added an orange scud and beadhead RS2 to the Chernobyl ant. Fishing upstream in this fashion I added a couple more rainbows to my count, one taking the RS2 and the fifth of the morning taking the orange scud. The fifth fish was actually the largest of the day and probably measured out at 13 inches and quite chunky. I took a quick photograph of this fish and resumed casting. I reached a point where there was another fisherman above me working some nice water so I climbed up on the bank and walked around his position and re-entered. As I drifted the three fly combination past a rock protruding above the surface a nice rainbow appeared and inspected the Chernobyl, but didn’t take. After multiple drifts from below and along the side, I moved six feet above the rock and stayed back from the water. I flicked a cast eight feet above the rock and let the flies drift directly downstream until the trailing flies went directly into the rock. The big rainbow couldn’t resist and appeared to grab the scud. I set the hook and the rainbow thrashed a bit and moved out from the rock. I applied some side pressure and moved it a foot or two to the right when viewing from upstream. The rainbow appeared to be increasing its resistance and made a quick head snap to the right, and the fly came hurtling back toward me. 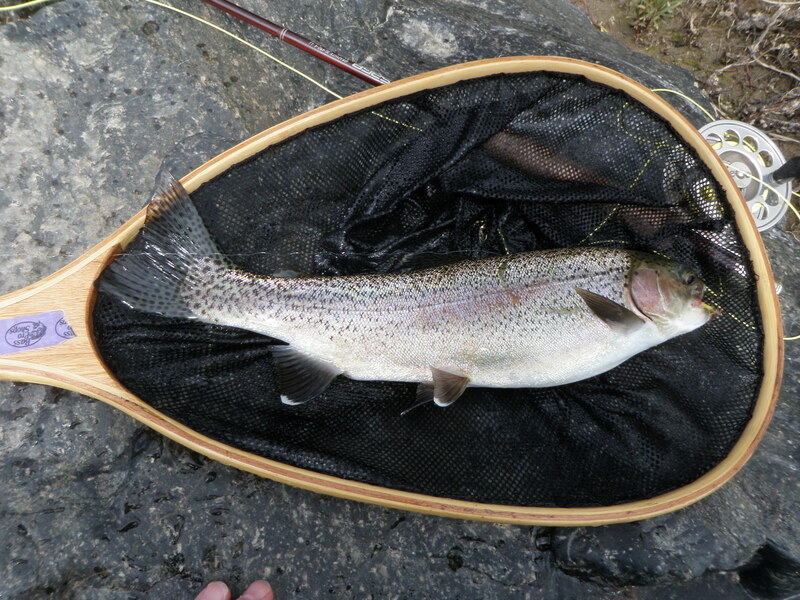 This was quite disappointing after working hard sight fishing to large trout all morning. 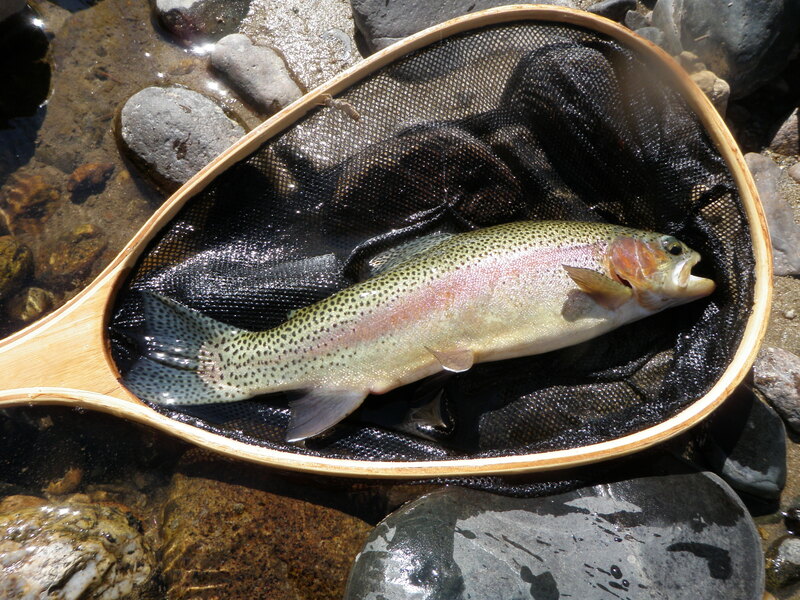 I moved on and began using the technique of drifting the flies from above to large boulders that appeared to have cushions or holding water above the rock and shortly after the hookup with the large rainbow experienced a momentary hookup with another fish. Alas I was running out of good water to deploy my newfound successful technique and it was now early afternoon and getting close to the time when we’d committed to return and meet the girls. I waded across to the opposite bank and began walking down the path to meet Steve. When I got twenty feet or so above Steve, he suggested I stop and check out a small eddy along the bank. I stood and peered into the water for a minute and spotted at least four beautiful fish in the small 5 X 5 eddy. 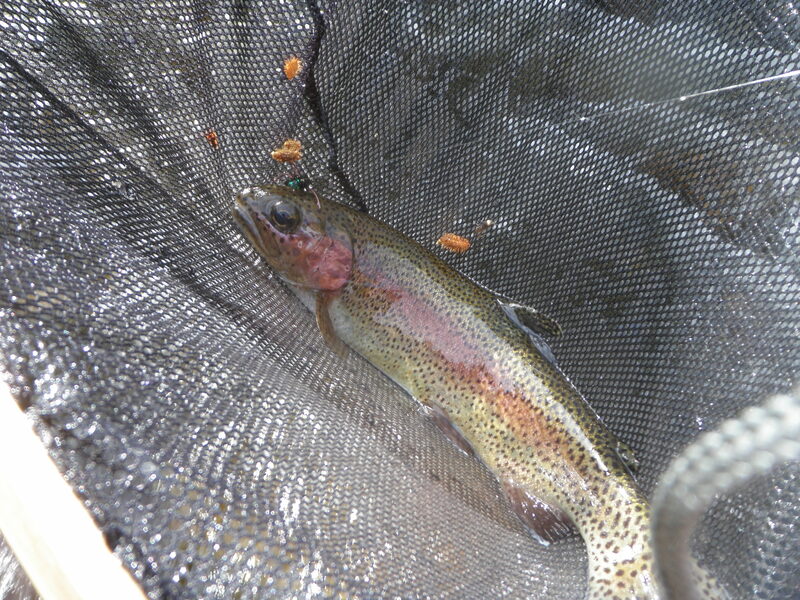 Two gorgeous rainbows were facing downstream along the bank as the current actually eddied back and brought food to them. Steve had exited the water and said he didn’t know how I’d get a cast to them and was standing behind me. It was actually quite easy from my position above the fish, and I flicked the Chernobyl, scud and RS2 into the water on top of the two fish. On the first cast neither showed any interest, but a second cast below them drifted back through the two and the fish furthest from me made a slight movement with its head. I suspected it sucked in one of the nymphs with this maneuver and set the hook. Sure enough I had a fight on my hands and played the rainbow as it thrashed and fought. 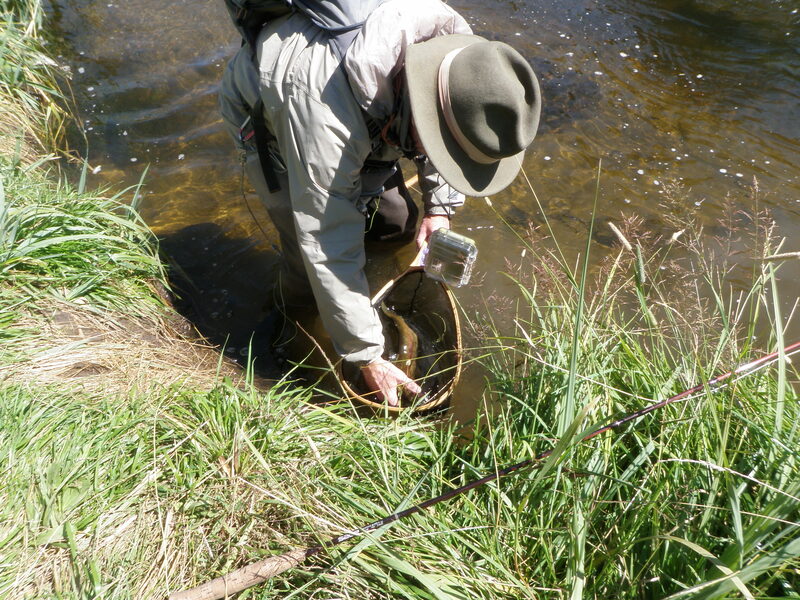 Since I was close to the fish I could control it fairly easily and brought it to net while Steve looked on. Steve kindly took my camera and snapped a few photos of the purple hued beauty. It was a fine ending to an enjoyable day of fishing on the Yampa at Stagecoach.